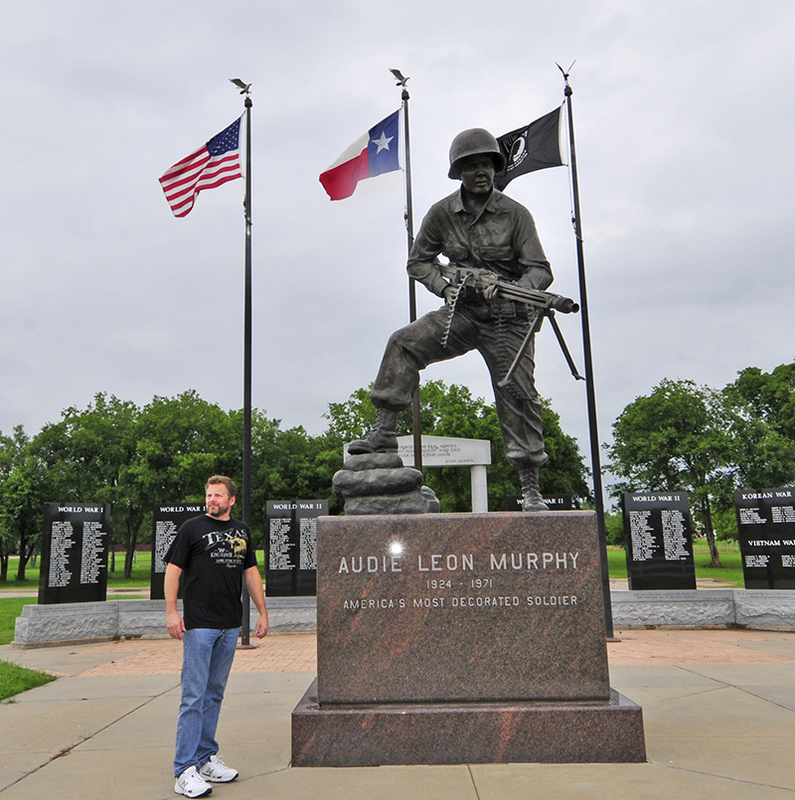 May 17, 2015 • CATEGORIES: Features • TAGS: 2015-Texas-Trip. Today was my last day in Texas. 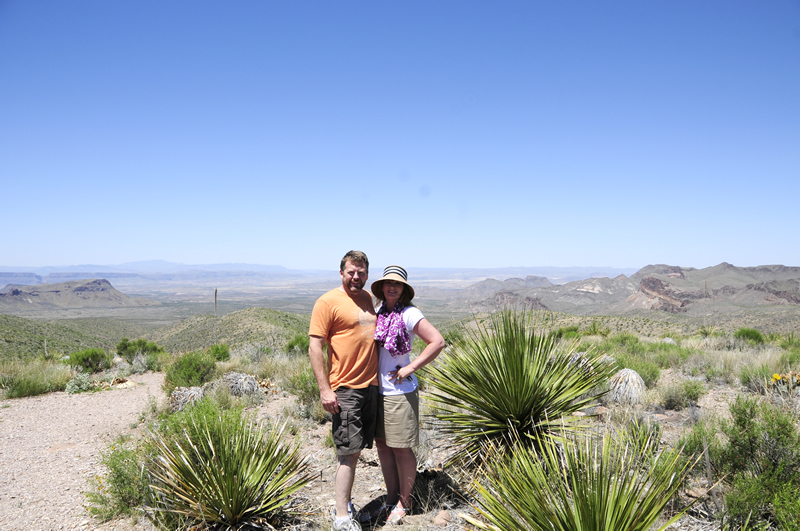 Both Ann and I feel satisfied that we did enough and went enough places to get a taste of Texas regions. We appreciate Lee, Sam, Brian and Jason for taking time to meet and talk with us. Also, as always, we appreciate everyone’s suggestions!! To bid me a memorable goodbye, Amarillo threw me a thundershower party. There was thunder, lightening and plenty of rain. The worst of it came just as I stepped out of the motel with my arms loaded with stuff for the Jeep. 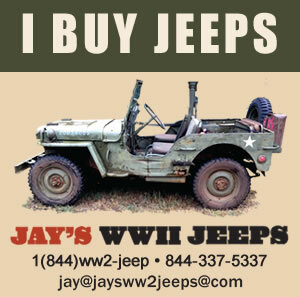 So, I ran for the jeep and unlocked it as quickly as I could, but I still got pretty drenched!! I hopped in the jeep and drove to the covered area by the reception desk and snapped this photo. Rather than try to photograph the Cadillac Ranch area in the rain, I headed north hoping to escape the storm. The plan actually worked. Within an hour I was sailing along under clear blue skies. 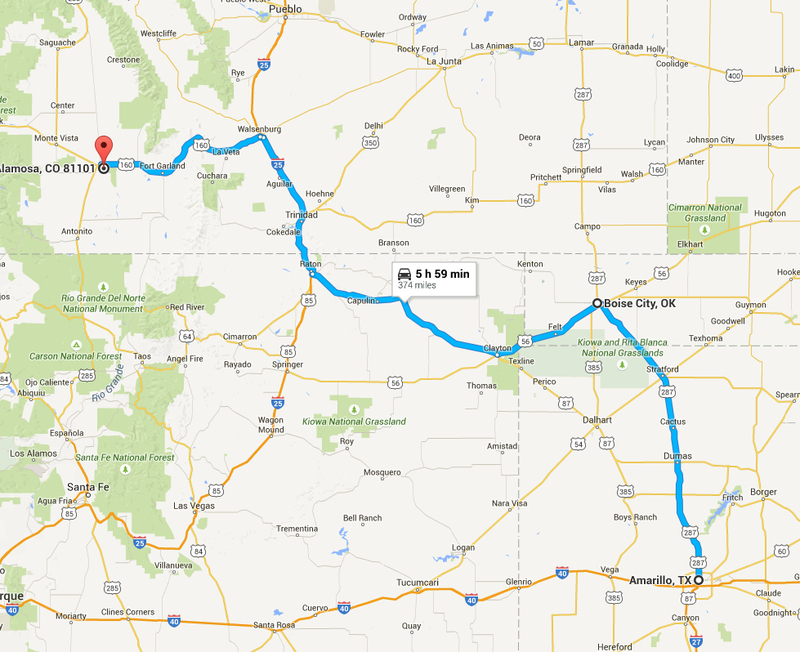 I wanted to drive to Oklahoma to see Boise City, a place heavily affected by the Dust Storms of the 1930s. The museum wasn’t open when I drove through the city, but I did find this tribute to a bomb dropped by a B-17 during 1943. My wife reminded me that this is why bombs are not armed until ready to drop. There are a surprising number of accidental bomb droppings I’m told, but safety procedures and good luck have kept us safe. 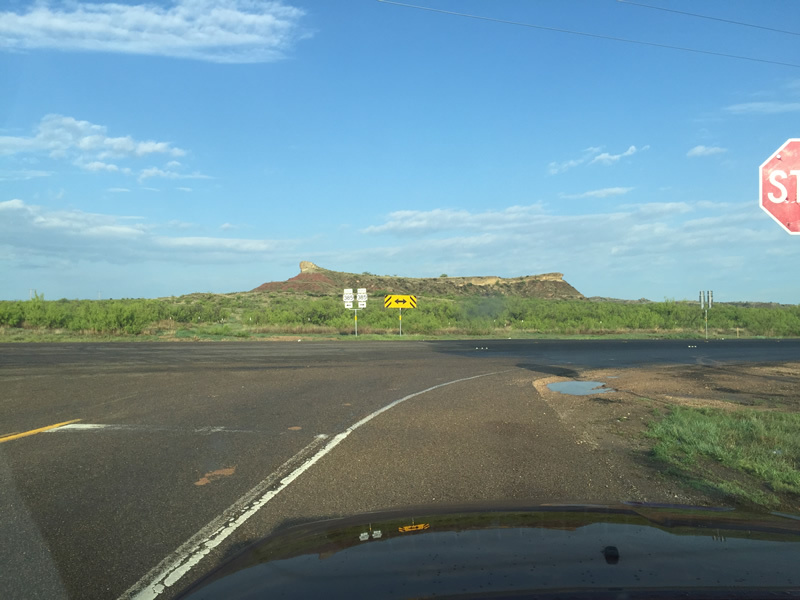 May 16, 2015 • CATEGORIES: Features • TAGS: 2015-Texas-Trip. This was my view for much of today. 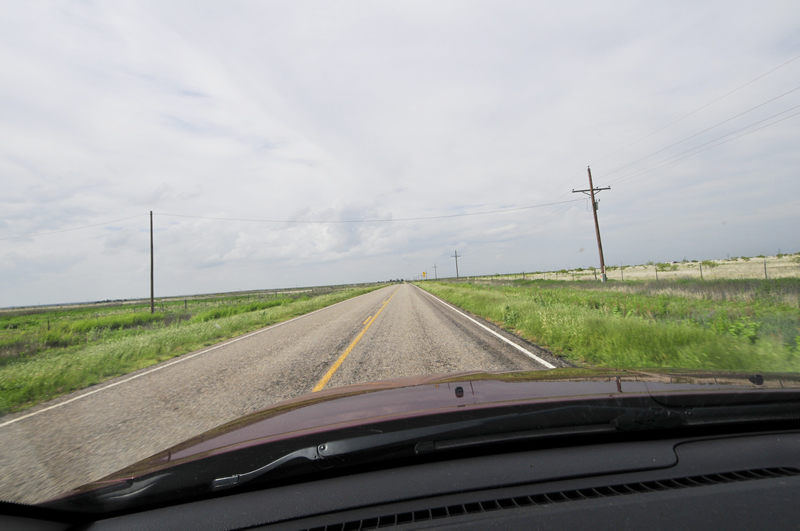 The Grass covered prairies of the Texas panhandle stretch for miles and the roads are straight and fast. 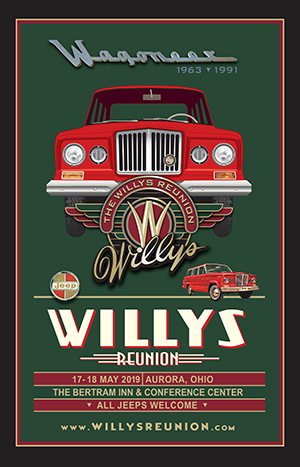 Today was the first day of the Midwest Willys Reunion, so I hope every has a good time there! 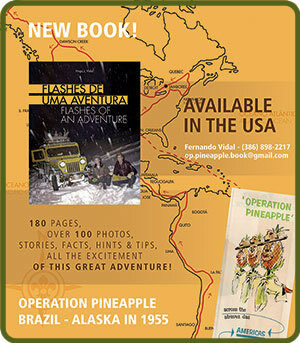 I do have a few books and t-shirts available through Bob Christy. If you see him and can slow him down for a minute, he’ll help you. 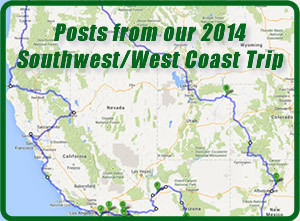 I began today knowing I’d be on the road longer than I had since the early part of our trip. (Yes honey, read long lonely roads!). 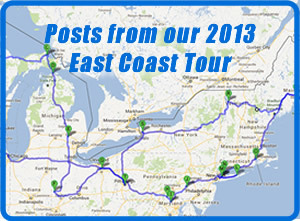 Fortunately, there were a few stops and surprises along the way. Only in Texas would you find a Texas-shaped waffle maker. 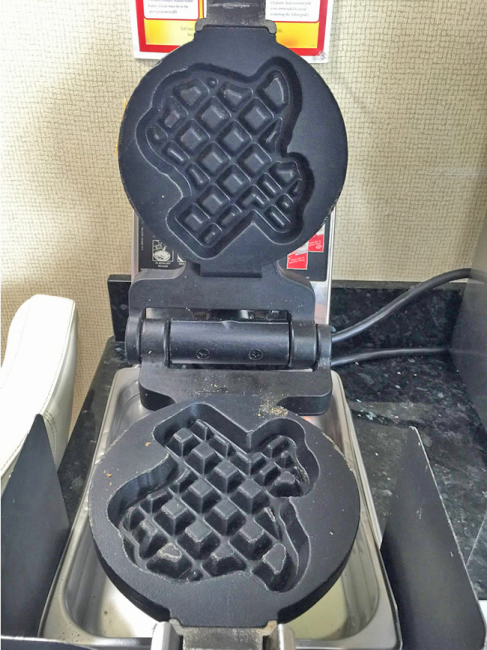 We saw these at several motels. The first surprise was west of Wichita Falls. 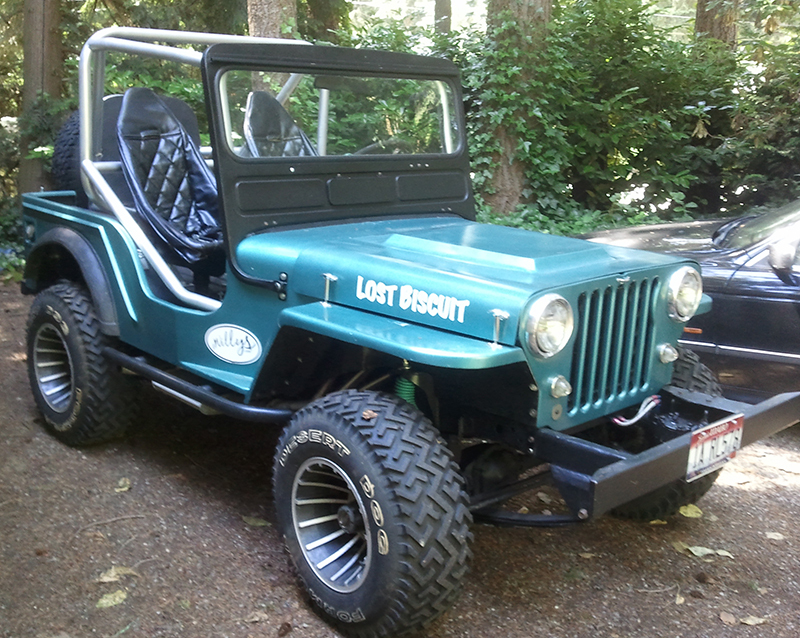 When I saw this CJ-3A, I braked immediately. I *think* it is for sale. 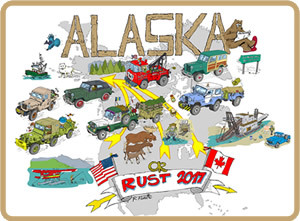 It’s got rust. It also has some allstate front hubs. Not much longer after I saw this 3A, a truck pulling a trailer with an M-38 whizzed past me. I couldn’t pull out my camera in time to capture that one. 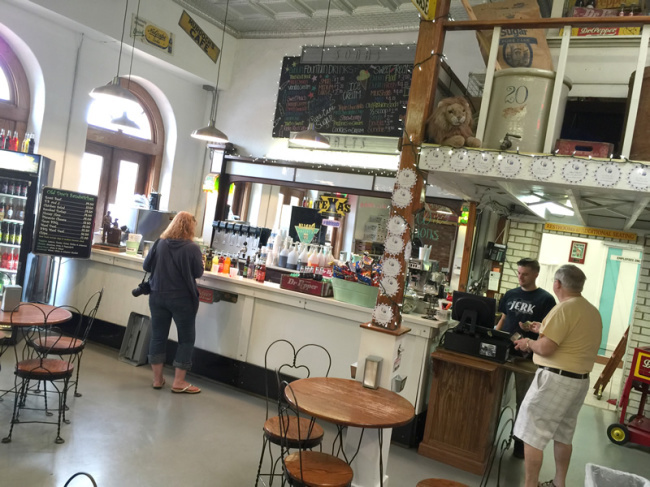 May 15, 2015 • CATEGORIES: Features • TAGS: 2015-Texas-Trip. 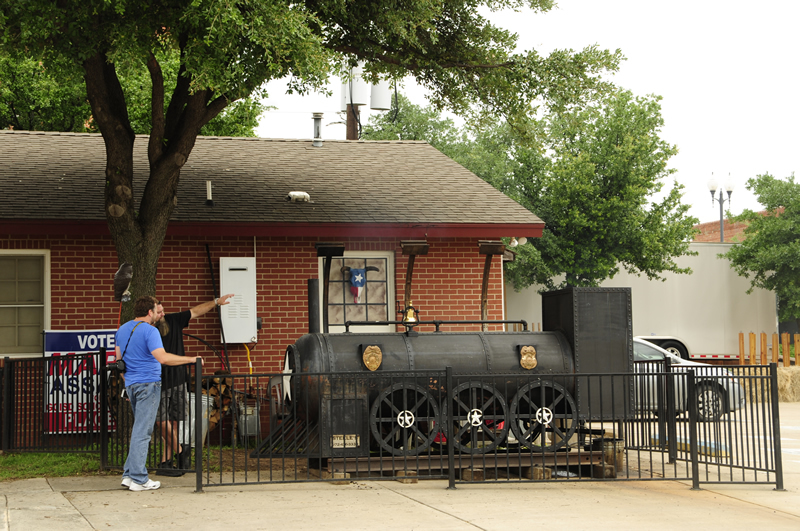 The owner of this BBQ restaurant in Grapevine was a retired cop who had never worked in a restaurant launching his BBQ restaurant. Last fall he had someone build a custom smoker that looks like a train. Here he is explaining how it works. Despite it being the hardest job he’s ever had, he loves running the restaurant. Ann’s grandfather took a turn for the worse. After I watched her stress eat two bags (small bags) of M&Ms I knew it was time to send her back for a few days. So, she arrived in Pasco Thursday evening. After dropping Ann at the airport I left for Bowie, TX. Prior to her departure, we attempted to accomplish one thing. We wanted to see the cowboy glockspiel in the town of Grapevine. The cowboy glockspiel is a clock tower. At certain times of the day, two automatronic cowboys appear on the tower and engage in a gunfight. I’m told one always dies, but never the same one. The death is chosen at random by a computer. We arrived in Grapevine at 11:30am, all ready to watch the gunfight unfold. It turned out we arrived as the town was readying itself for their annual beer celebration. So, there was a great deal of hustle and some bustle all through town. Yes, lots of hustle and bustle in town, but not evident at all in this photo of downtown. This vintage truck was used to haul a bunch of stools into town. At the high noon hour, we stood ready to watch the gunfight. It never came. Over the loudspeaker we heard that the weather wasn’t cooperating, so the cowboys wouldn’t be fighting. The problem was the weather was just fine. Since Ann’s plane left from the nearby DFW airport, it didn’t make sense to go anywhere else, so we walked through shops and ate lunch. We blew enough time that we were ready to watch the 3:00pm cowboy show. However, even though the weather improve (it was a hot 95 degree day with no rain and some high clouds), the cowboys still didn’t come out due to weather. Needless to say, that spoiled our day. So, Ann brought up a video on Youtube. We didn’t need to come to Grapevine after all! On the plus side, it is a cute town! 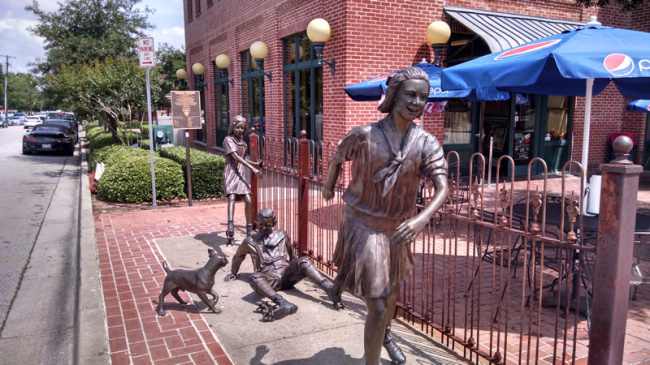 There were a variety of scupltures around town. Tomorrow I plan on going to Wichita Falls and then on to Lubbock. 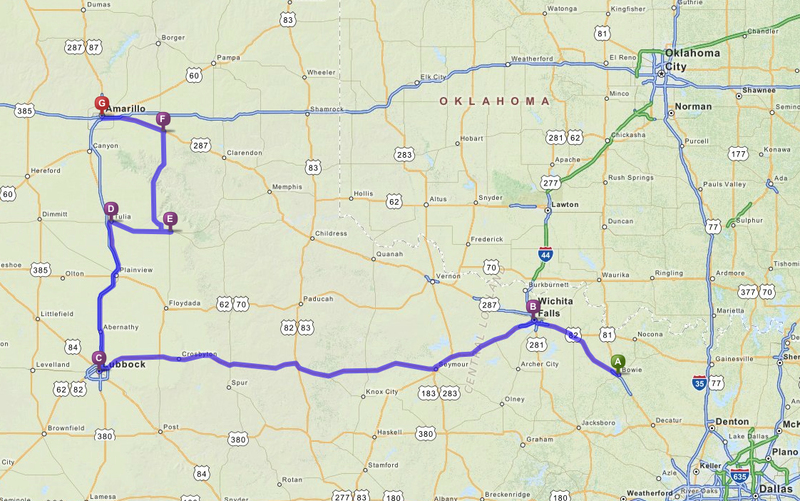 I hope to make it to Amarillo by nightfall. 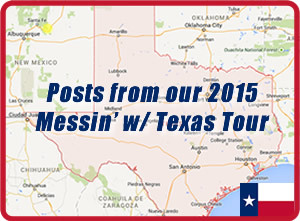 We are nearing the end of the Messin’ with Texas tour. It sure has been fun! May 14, 2015 • CATEGORIES: Features • TAGS: 2015-Texas-Trip. Audi Murphy looks taller in person . 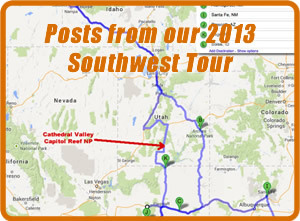 . .
Today we began our trek northwestward. We got going later than planned, as usual, so I passed up my opportunity to be manscaped at the local barber, Milford’s, that Jason recommended. 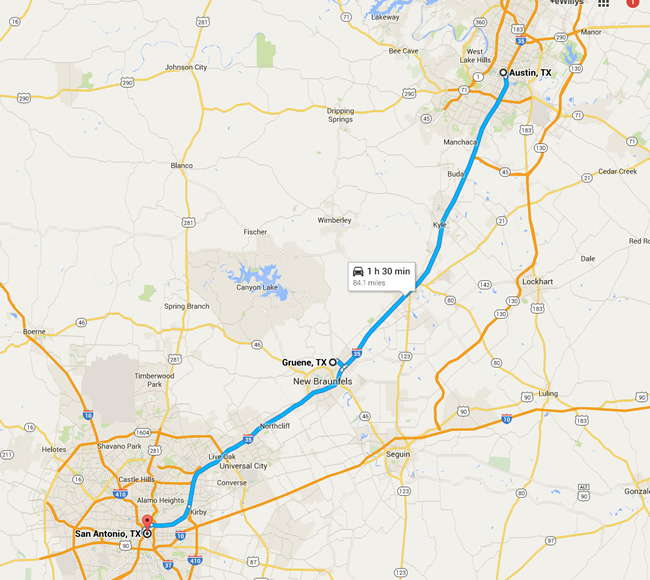 We really needed to get going so we could beat the rain that was heading our direction from Dallas. So, I remain longhaired. Our first objective was Whitehouse, Texas, to locate a big hat. Along the way we passed two towns Jason mentioned during our history lesson: Sacul and Reklaw. 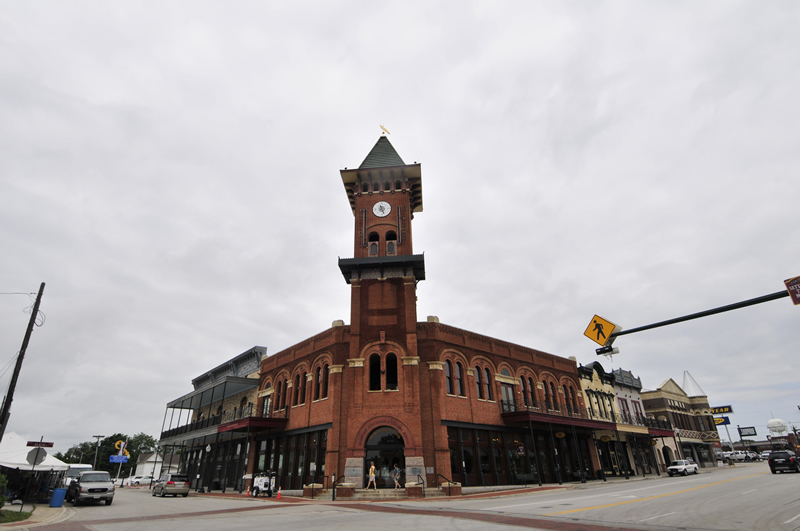 These two adjacent towns faced the same problem when they applied for a post office. Both original names were taken. So, the town brain trusts decided to spell the names backwards. Thus, Lucas became Sacul and Walker became Reklaw. When we finally reached Whitehouse it didn’t take long to locate the hat. It’s a big white hat that sits atop a coffee shop. 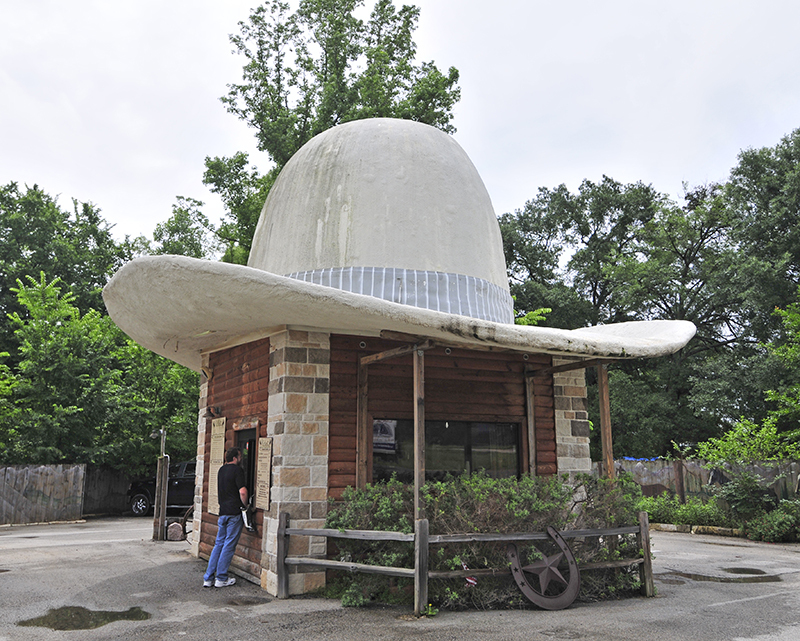 It just might be the largest cowboy hat in Texas! Of course, I had to buy a drink. May 13, 2015 • CATEGORIES: Features • TAGS: 2015-Texas-Trip. Jason Monday and I next to his M-677. Our goal for Tuesday was to stay dry. It wasn’t easy to achieve, because it rained hard at times! 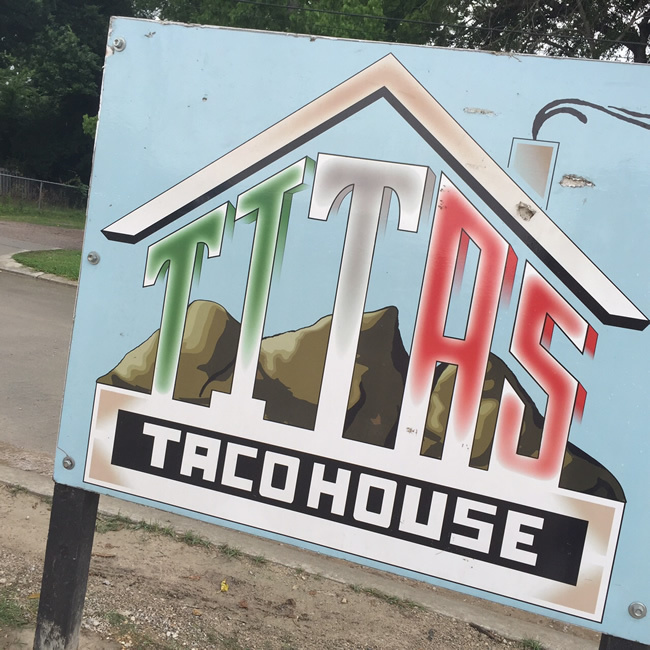 As planned, we began the day with Tacos at Titas Taco House in Humble. Once again, they were awesome. This time I got to watch them make the corn tortillas. Their dough station sat just behind their serving station. They were pretty much rolling and cooking them as they served them. You can’t get any fresher than that! 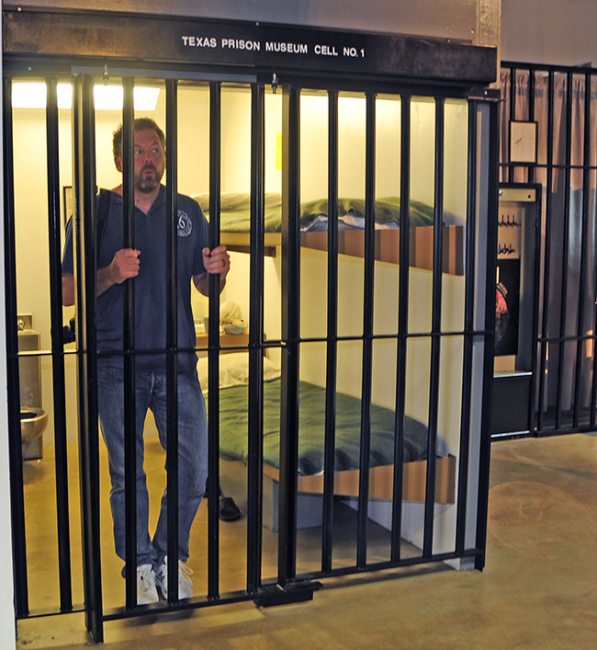 Front doors of the Texas Prison Museum. With breakfast finished, we headed for the Texas Prison Museum in Huntsville. Apparently, Huntsville is the prison city and for more than a half century hosted the prison rodeo. It was a big hit for the city economically and people from all over came to watch. Even some stars arrived to participate. One of the more odd events was the Monday Grab. A bag of cash was strapped to the neck of a bull. The prisoner who could grab the money and hand it to an official won the money. We saw some video and it was a wild event! The rodeo ended in 1986. Ann seemed to enjoy seeing me inside a cell. 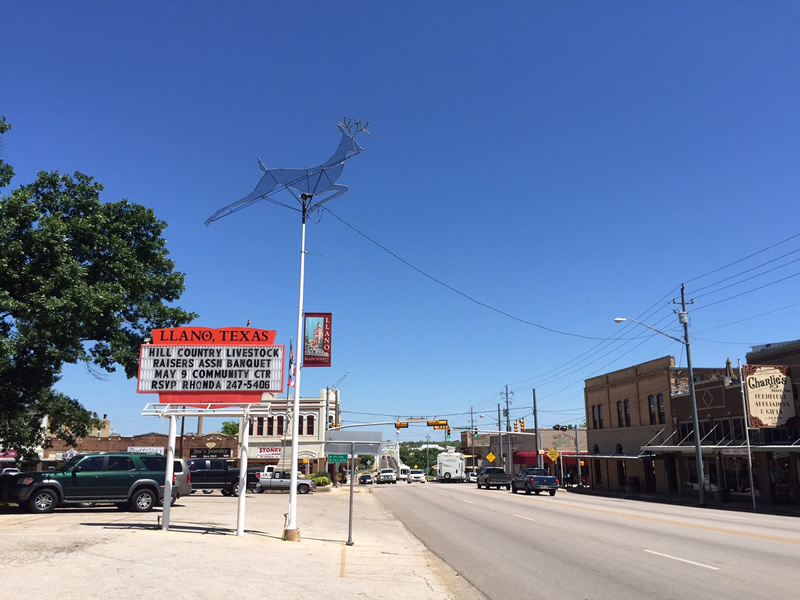 May 12, 2015 • CATEGORIES: Features • TAGS: 2015-Texas-Trip. Apparently, we needed some rest. We woke up early, checked emails, Facebook, etc, then fell back asleep for a nap. I blame the rain (seems as good excuse as any and it rained all day). When we awoke, I was hungry. 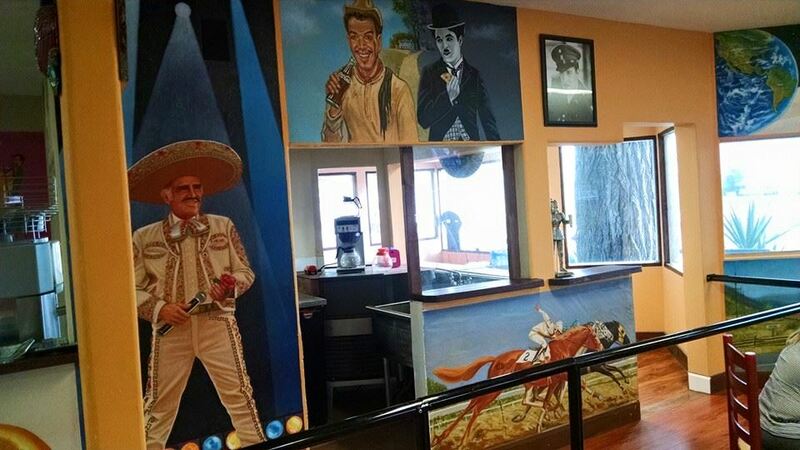 I found a place I wanted to try called Titas Taco House that had a five start YELP rating with 145 reviews. So off we went. 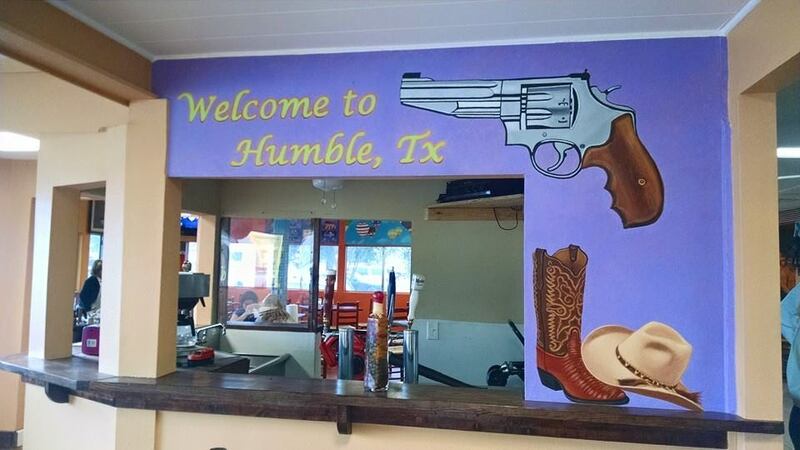 It was 11am when we arrived at the Humble, Texas, location to find a house converted into a small restaurant. We could see much of the dirt parking lot because it was already filled with cars. This bode well for our food adventure. Inside the restaurant there was no list of prices and no menu. There was a series of poles and ropes, suggesting that long lines were not unusual. Poles to help direct customer traffic. However, we must have timed it right, because we walked right up to the order station. 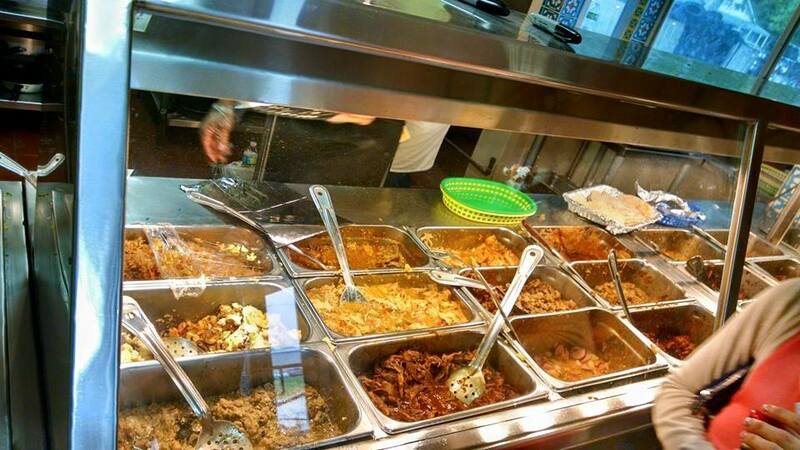 In front of us were about 20 different options for filling our tacos. Again, no names on anything. We had to ask what was what. 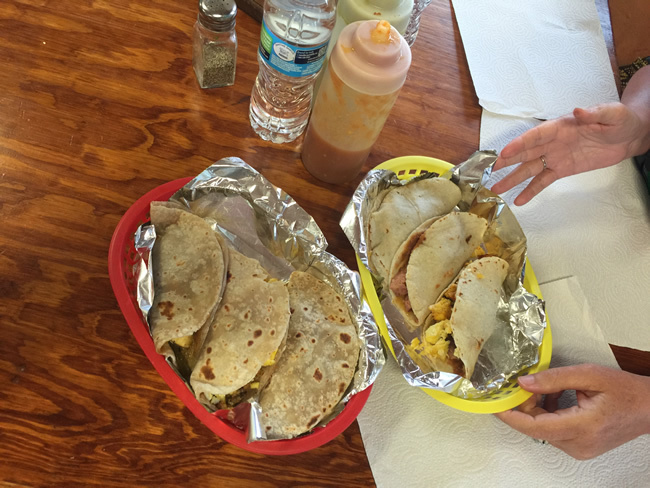 Ann decided on three corn tortillas filled with egg & sausage, potatoes and polish sausage, and poblanos and cheese. To make the tortillas, the server laid a thin layer of refried beans onto the tortilla and then added a small amount of filling. My ordered differed from Anns in that I had the flour tortillas. One was filled was some tasty napolitos. After we received our tacos, we walked to the register only to find out that we paid AFTER we ate. Perhaps that encourages people to go back through the line? 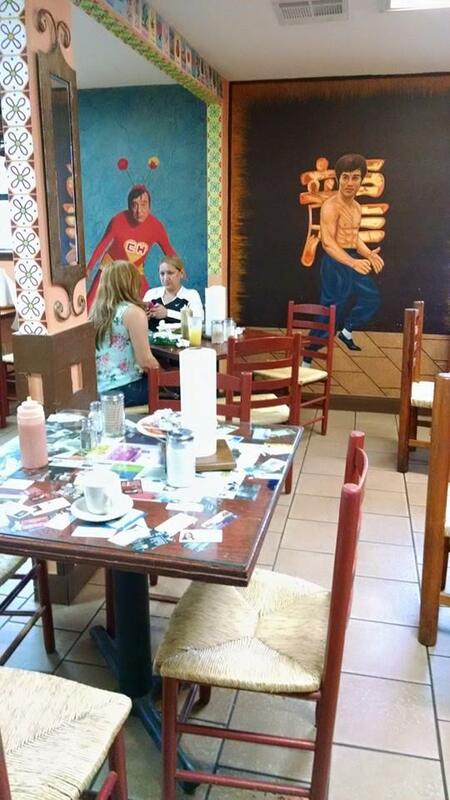 When we did go back they asked how many we had (6 tacos) and paid for them. It’s a honor based system. Kind of cool. The tacos were outstanding. It’s the quality of the home made tortillas that really make them work. The fillings were varied and excellent too, but it is so hard to find great, fresh tortillas. The inside of the restaurant had a great, funky feel to it. After breakfast, we returned to the hotel where we promptly took a nap (that would be nap number two). When we awoke, we went back to Humble to get Ann some new jeans at the mall. There’s nothing like shopping in a mall to make me sleepy, so when we returned again to the hotel we took nap number three. I guess we were more tired than I realized! When we awoke I was hungry again, but this time for some grits. I hardly ever fix myself grits, so we went to the local Waffle House for some cheap breakfast (even though it was 5pm). After that it was back to work the evening (no fourth nap today!). 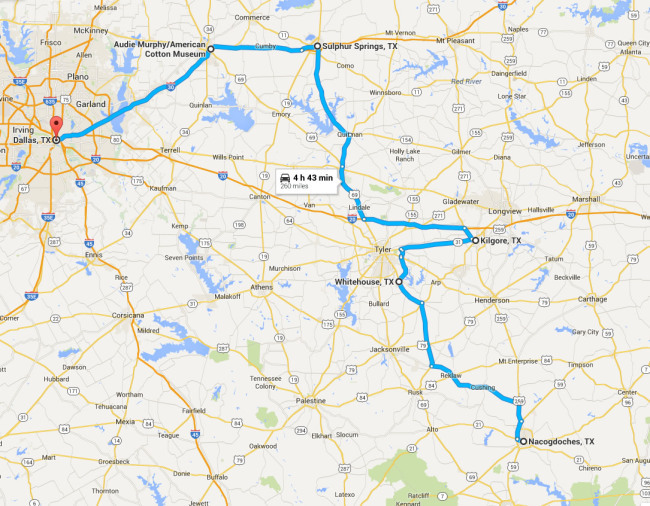 Tomorrow we plan to start our day with some more tacos, before heading north to Nacogdoches to visit Jason Monday. We expect more rain through the rest of the week. 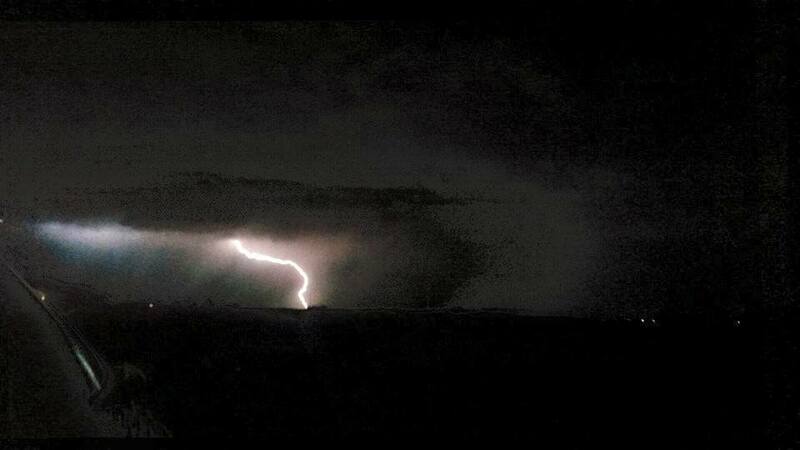 Hopefully, the tornados will calm down in northern Texas so we can make it through without that type of adventure! Sunday May 10 — Breaking up the Beatles?? Not again!! 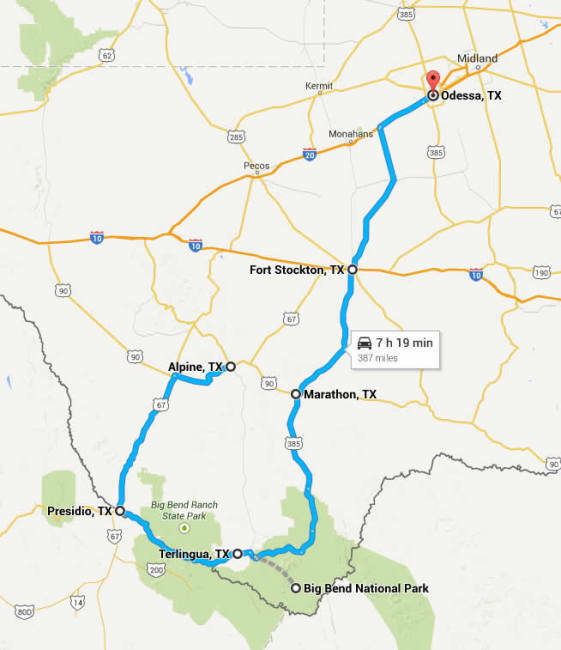 May 11, 2015 • CATEGORIES: Features • TAGS: 2015-Texas-Trip. 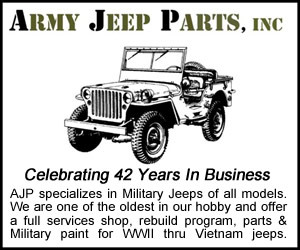 FYI: No jeep updates for Monday. They’ll appear Tuesday morning. New friends of ours. Brian is on the left, Melodie is in the middle, and Lauren (Melodie’s mother) is on the right. 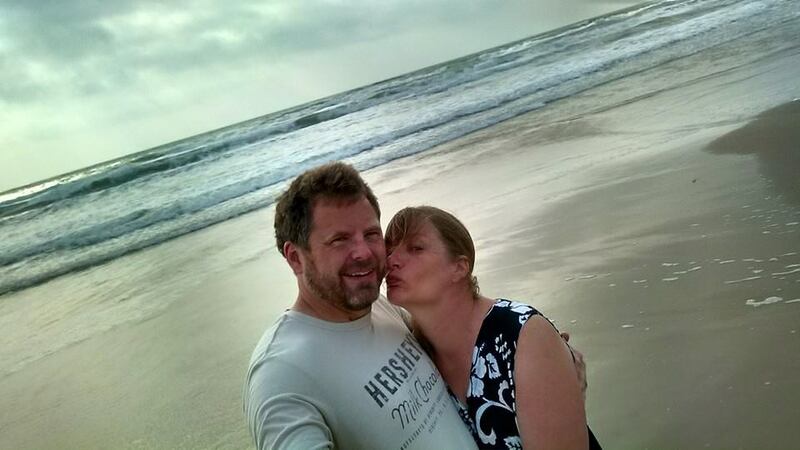 Melodie and Brian are a very happily engaged couple. It seems Lauren approves, for she was all smiles, too. Ann told them I’d be publishing their photo here. We wish you all the best of luck!! 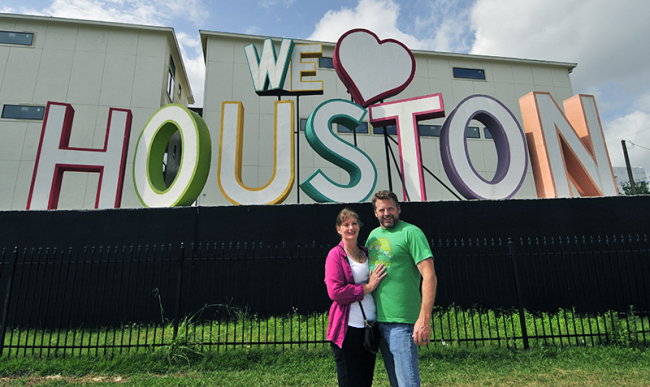 We thought Sunday morning would be a good time to explore Houston, due to the lack of traffic. Since I’d had my eye on a French bakery & Cafe just around the corner from the hotel, we didn’t drive far Sunday morning before we stopped at La Madeleine’s for a pastry. Well, one of us stopped for a pasty, because Ann can’t enjoy flour based pastries any more. So, I ran inside and ordered an apple turnover and a mini chocolate croissant (both crunchy and excellent). 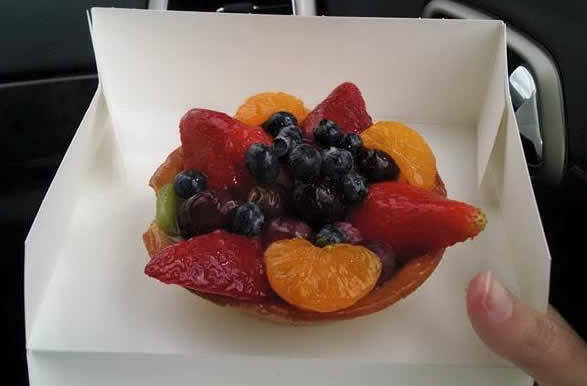 I also found a fresh fruit tart that Ann could eat. So, I gave it to her as a Mother’s Day surprise. After we consumed our respective breakfasts, we drove towards the Art Car Museum. Along the way, fate intervened. 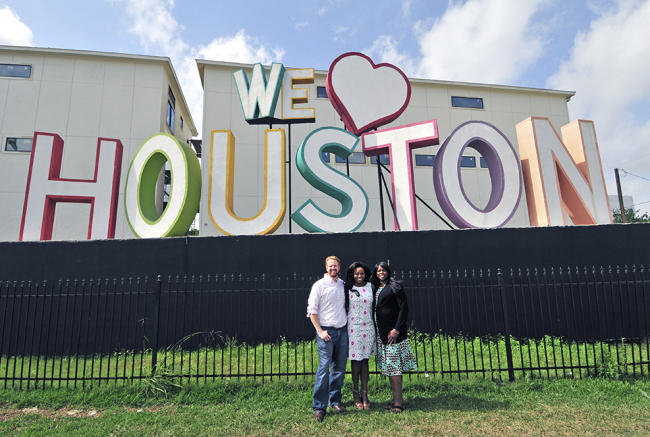 As we exited the freeway near downtown, we looked off to our right and spotted three people posing in front of a Love Houston sign. Naturally, we knew that spot was made for us to photograph, so we spun around the block and found a place to park. We arrived at the sign and met Brian Kozel, Melodie Smith, and Melodie’s mother Lauren Moore, who were just finishing up with their photos. Ann quickly volunteered to take the photo of all three, but the iPhone camera couldn’t capture the whole scene. So, Ann handed it to me. I bravely leaped (okay meekly backed) into the three lane road to get a better shot, but dodging oncoming cars racing at 55mph was a stretch for my poor camera skills. Of course, there was no way I was sending Ann into traffic. With her bum knee, she doesn’t play live Frogger so well. It was at this point that my wise wife spared me from certain doom and volunteered to use our Nikon to take the photo and send them the resulting image via text. For some reason, they agreed to have a couple of crazy Washingtonian’s send them a text, which is how we got to know them. We also learned that Brian and Melodie are getting married, so congrats to them! The building behind us was just built. I suspect this sign was much cooler when the building was there. With our love for Houston documented, we jetted on down the road for our next destination. I’m pretty sure I’d first learned about Houston’s Art Car Parades from a Smithsonian Magazine article, probably in the 1990s. 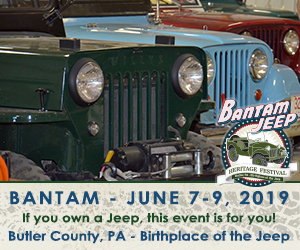 The event is held annually on the second Saturday in April and has become a big deal. 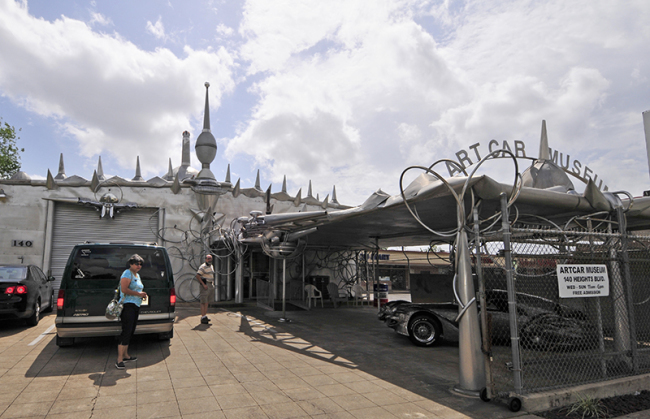 One of the spinoffs of the parade is the free Art Car Museum. We pulled up to the museum. Expectedly, it was not your average building. What really surprised us was to see a vehicle parked under the front carport that we’d seen before. 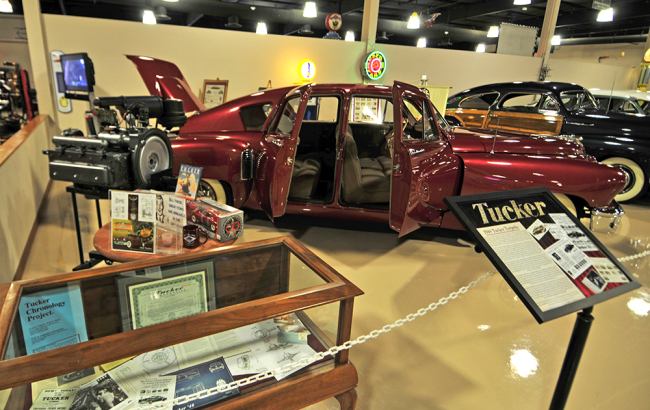 It took us a little while, but we finally figured out it had been on loan to the Studebaker Museum in 2013 when we stopped in there. Small world! 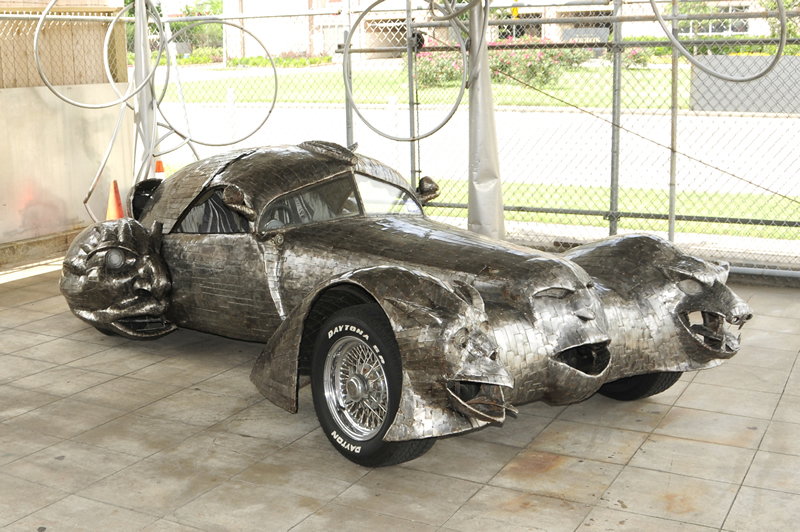 This is the art car we saw at the Studebaker Museum. The eyes in the front light up blue. 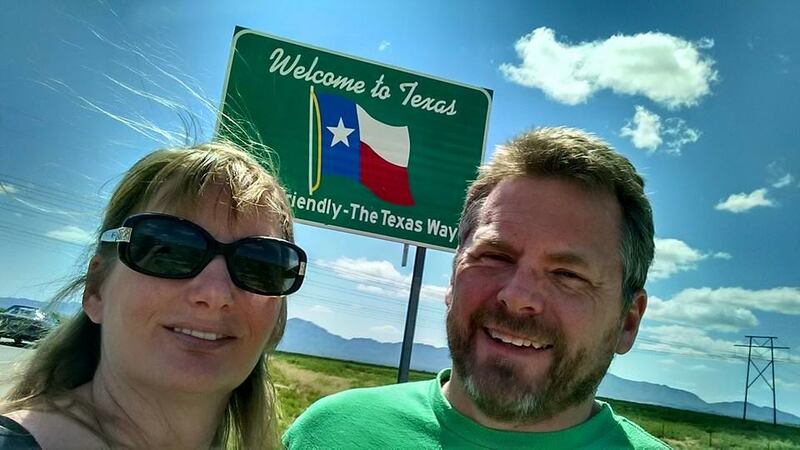 May 10, 2015 • CATEGORIES: Features • TAGS: 2015-Texas-Trip. The clouds looked menacing, but it was a fine day for touring the USS Lexington — though the wind was a pain on the Flight deck. 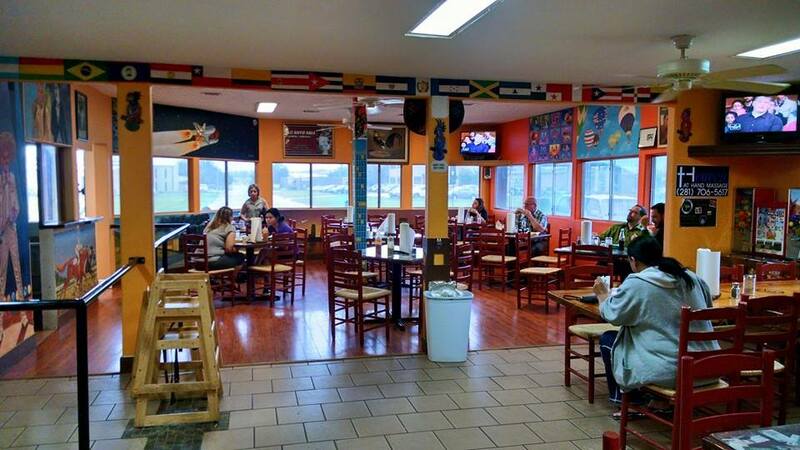 On Friday night in Corpus Christy I was hungry, so after searching through YELP, I finally found a place to go eat some food that was highly rated AND open after 9pm (best hidden food gem in Corpus Christi was one review). It was a small ‘Asian Street Food (my description)’ place called Z Counter. The reviews were great and the photos of the food made me feel optimistic. So, off we went. Click on the photo and you’ll be able to see the whole menu. 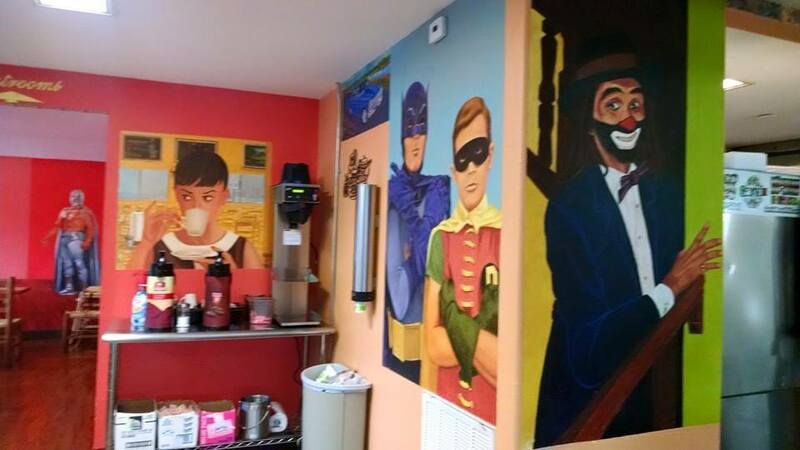 They also had photos of all the items on a separate wall. They only have this one location. I wish they had one near us in Pasco! I don’t quite get the name, but I sure like the food. I’ll just cut to the chase and say the reviews were right on the money. I had a simple pork bowl, yet they turned that into delicious contrast of fresh, sweet, hot, and smokey (from the charbroiled pork) that made it delightful. We also had some Spam Musubi, which was also surprisingly good. 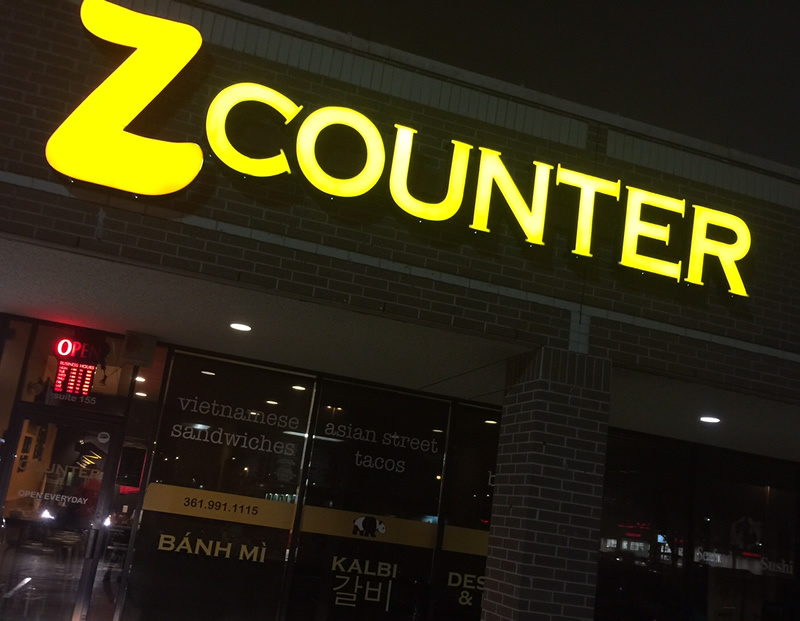 In fact, I only had one problem with the Z Counter: I was too full to order and try some of their other dishes. So, Ann and I agreed that on Friday we’d return for lunch. 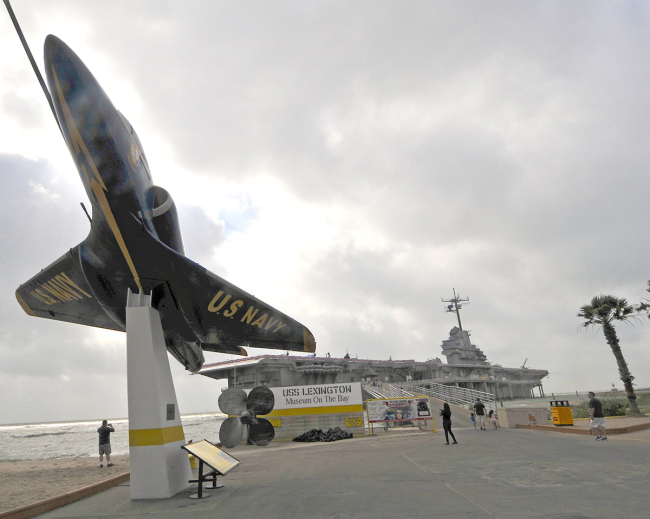 On Friday morning, we tackled our biggest planned event of the day, a trip to the USS Lexington (CV-16) Museum. 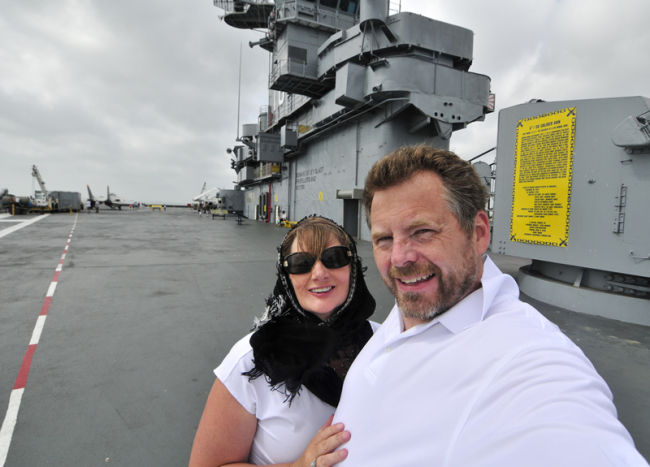 The USS Lexington is an Aircraft Carrier ‘parked’ just off the shore in Corpus Christi. One of the things I learned is that some folks call the Carrier a ship (I’m told that is correct Navy-speak for a vessel of that size), while other folks gleefully call them boats (I’m told that was one way certain Air Force personnel would needle Navy personnel). So, call it what you want, but for me it was my first opportunity to explore an aircraft carrier. The carrier is nearly moored on the beach. 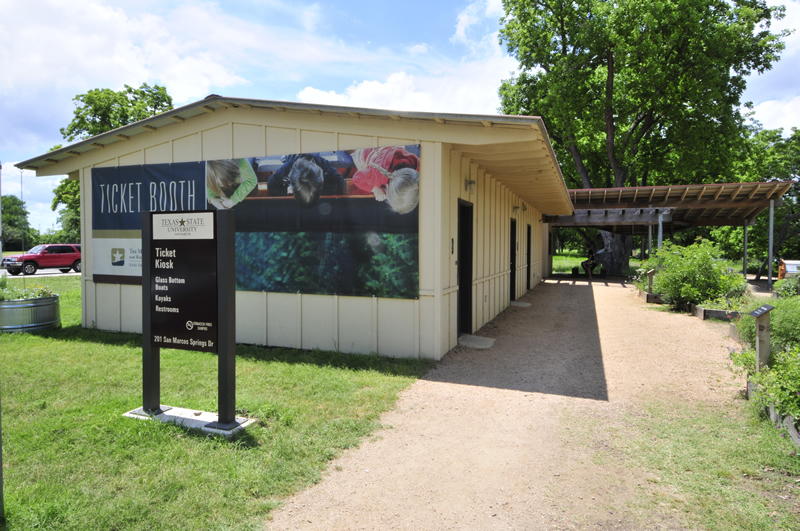 There’s a ramp to walk up to the museum entrance or visitors can wait for the shuttle. May 9, 2015 • CATEGORIES: Features • TAGS: 2015-Texas-Trip. Of course, we had to take this photo. Had we shot it last night, the sun would have been perfect. As it was this morning, we had to play with the light quite to make this work. 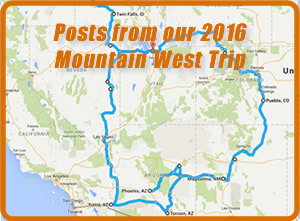 We woke up early Friday morning with plans to drive north. 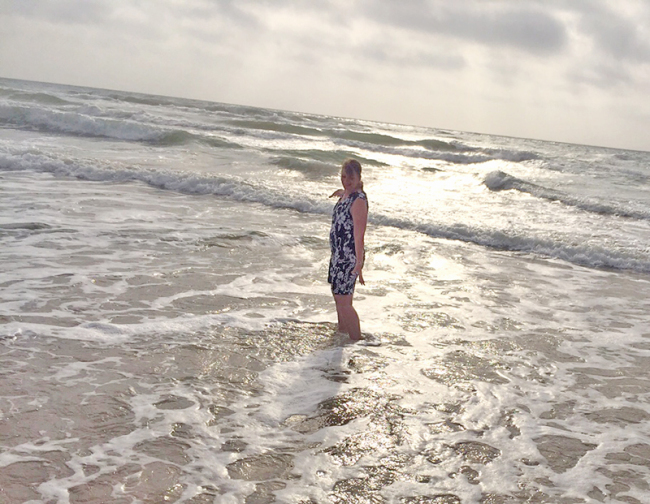 But, before we left South Padre, Ann wanted to walk in the surf. So, we drove to the beach. Despite the red-flag-beware-of-the-water warning, we walked out to the water. I had to deliver a reminder to my wife that she shouldn’t be playing in the surf at all, because I didn’t want to have to carry her back to the car. So, despite her inner-child, she behaved. 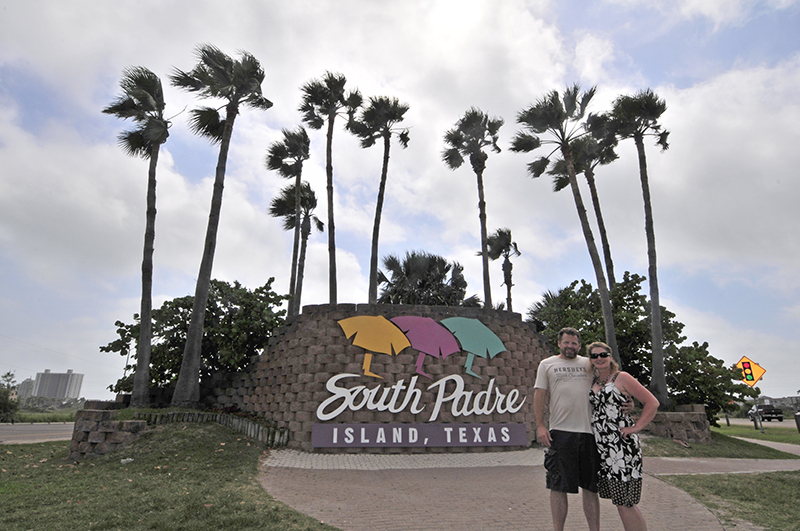 As we left the beach we encountered the South Padre Convention Center and these large upside down head sculptures. May 8, 2015 • CATEGORIES: Features • TAGS: 2015-Texas-Trip. Oh NO! Attack of the killer bee!! Today was a long day of driving, our longest day in a month. We drove 400 miles, which isn’t that far in terms of distance. However, our need to document the trip and take photos can turn quick stops into hour-long affairs. So, we tend to need lots of time, which we had because we both woke up at 7am on Thursday wondering why we were awake (we are late risers). It was in part due to the air conditioner’s inability to cool our room. So, rather than fight the air conditioner, we decided to pack and get going. Our first stop of the morning was Lackland Air Force Base (aka new name: Joint Base San Antonio), the home to the Air Force’s Basic Military Training facility. It was there that Ann went through basic training. Apparently, she had some fond memories of her time there. Unlike other recruits, she found her experience much less stressful than growing up with her mother. Even better, she got to eat to each three times a day as much as she wanted! The only downfall, besides the marching, was a set of golden arches she’d see everyday just outside the training grounds. She yearned, but never got a chance to eat there. Well, today was her lucky day, but first we had to find the training ground. Having ditched Siri’s navigation, I’ve turned to Google Maps. That app took us to the main base. Of course, I didn’t know any different, but as we drove around, Ann said she didn’t recognize anything, because the Air Force ‘never let us mingle with real military people’. It took us a while to realize that the training grounds were on the other side of the highway. So, over the highway we went. That’s when things started to look familiar to her. She pointed out the airmen dressed in their blues marching on the parade grounds. Then she pointed to some newer recruits having to go through inspections. Finally she giggled at the sight of the Rainbow Flight, the newbies who had not been issued their military clothes, so they had to dress i their street clothes (which were a myriad of colors). 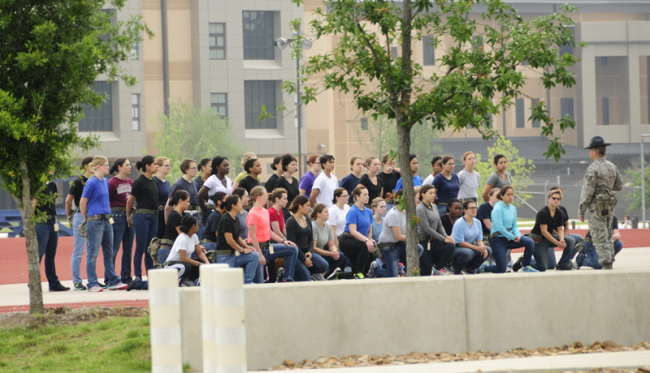 Airmen in their blues close to graduation. 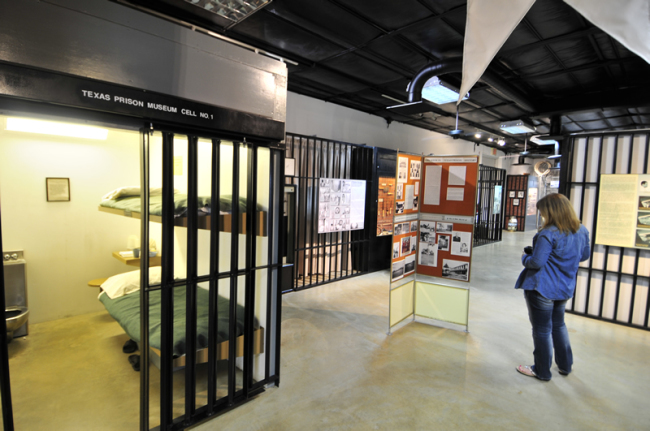 Ann’s basic barracks. 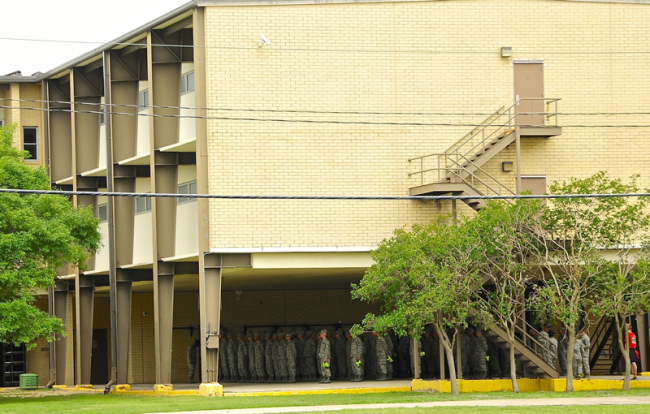 In the morning she and her co-airmen had to go down the stairs with both hands on the rails chanting. At the bottom the had to line up under the covered area as shown. The Rainbow Group. They are the newbies. The don’t receive their equipment until their entire group arrives. Ann had to stay in her street clothes for two weeks before all of her group arrived. May 7, 2015 • CATEGORIES: Features • TAGS: 2015-Texas-Trip. 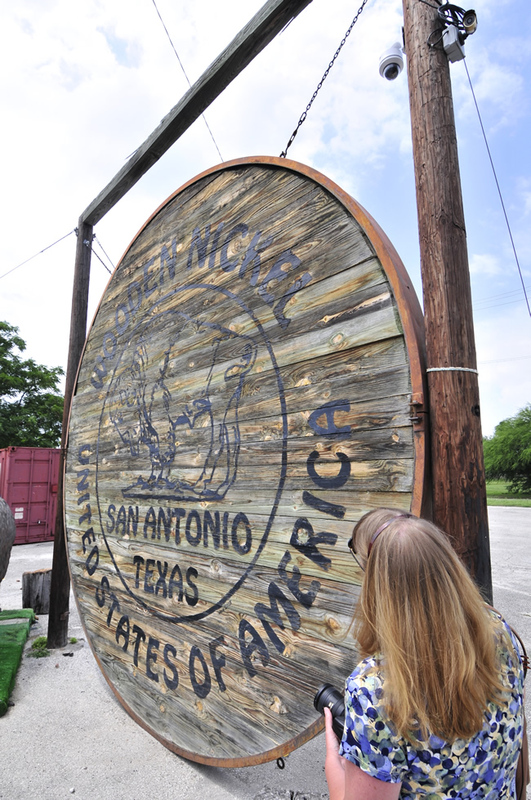 Guinness Book of World Records deems this the largest wooden nickel in the world. Yesterday we spent time in downtown San Antonio. Today we explored areas outside that central area. 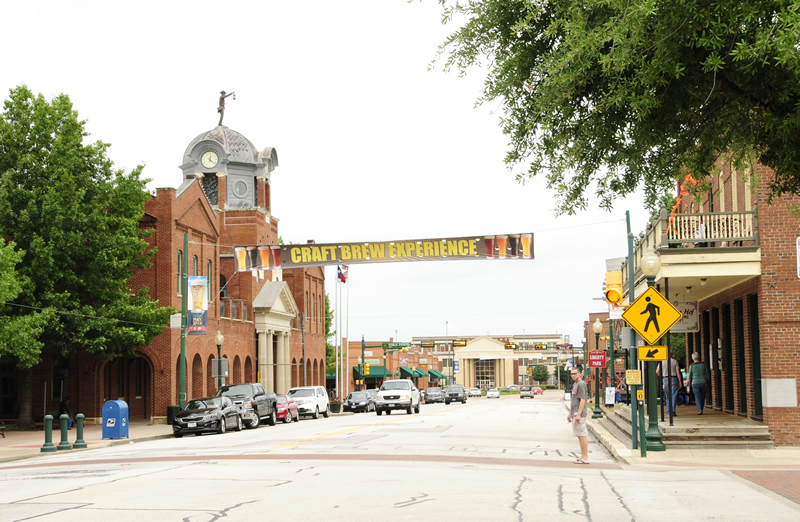 First, we walked a couple blocks to Market Square, a three-block area that has been home to the city’s open market roots since the 1890s. At that time San Antonio was Texas’ largest city. 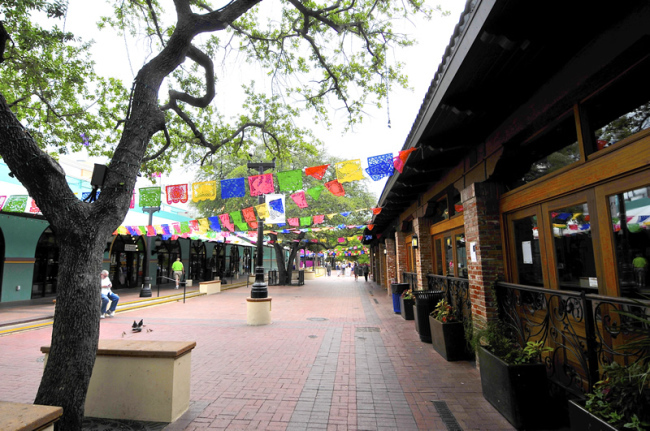 The area was a multi-cultural area due to Mexican, European, and Asian immigrants. 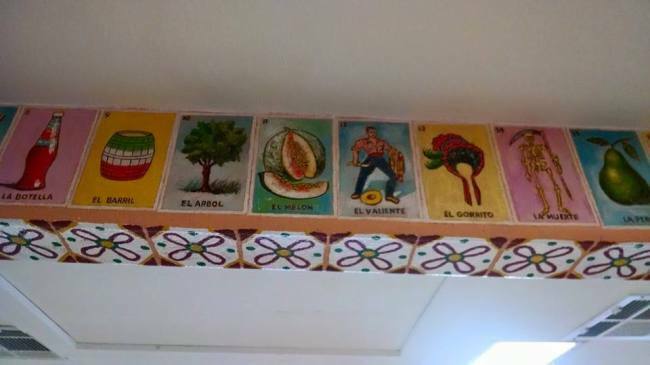 However, these days the area has primarily a Mexican flavor. In fact, we walked to the market specifically to taste the flavors of Mi Tierra Cafe Y Panaderia. The restaurant was first opened in 1941. It now seats up to 500 people and, according to their own marketing, “Never closes”. It’s a twenty-four hour a day, every day, restaurant. There’s a party atmosphere inside with christmas lights wound around posts, colorful Mexican banners hanging from the ceiling, and reflective pinatas hanging overhead in the lobby. 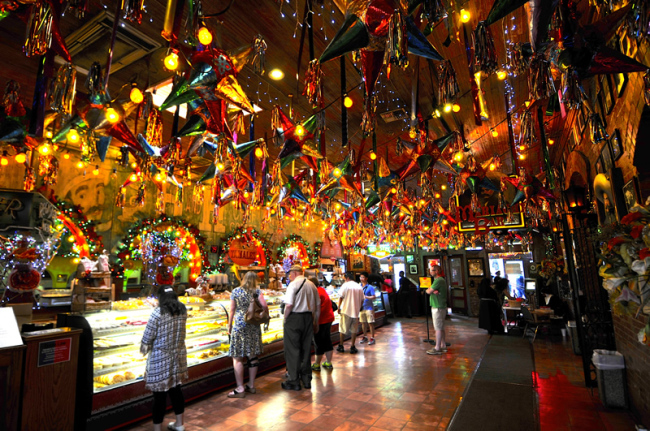 The lobby of the Mi Tierra Cafe Y Panaderia. The baked looks looked really good! I chose to go there, not just because of its history, but because they serve a roasted goat dish, something I don’t get often enough. When it arrived, I was very pleased; plenty of goat, along with a tasty cheese enchilada, made for a good meal. 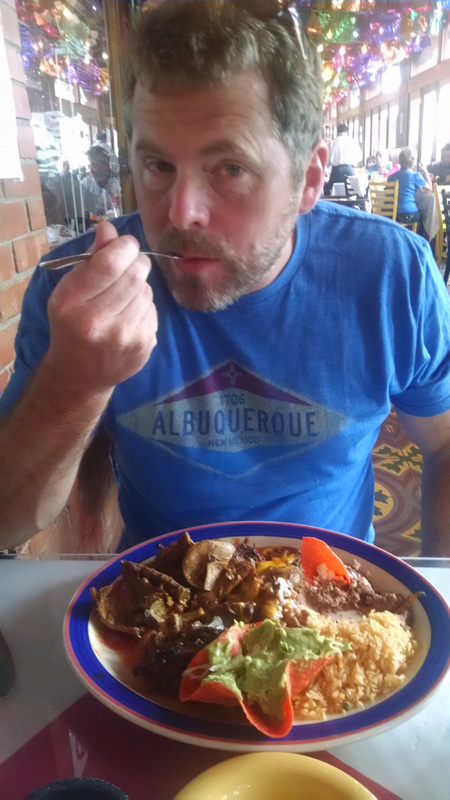 The rice and beans were pretty standard tex mex, but I was not surprised. After our lunch (we had a late start on Wednesday), we wandered Market Square. We even found a couple gifts for our mothers, though said gifts shall remain unmentioned since my mother peeks in on my trip reports from time to time. Market Square’s ‘Produce Street’, though hard to find much produce here any more. Just minutes later bus loads of people flooded this area. May 6, 2015 • CATEGORIES: Features • TAGS: 2015-Texas-Trip. We left Austin today bound for San Antonio. We tried a detour into the historic old town of Gruene, but found it more tourist trap that historic, so we continued on to San Antonio. 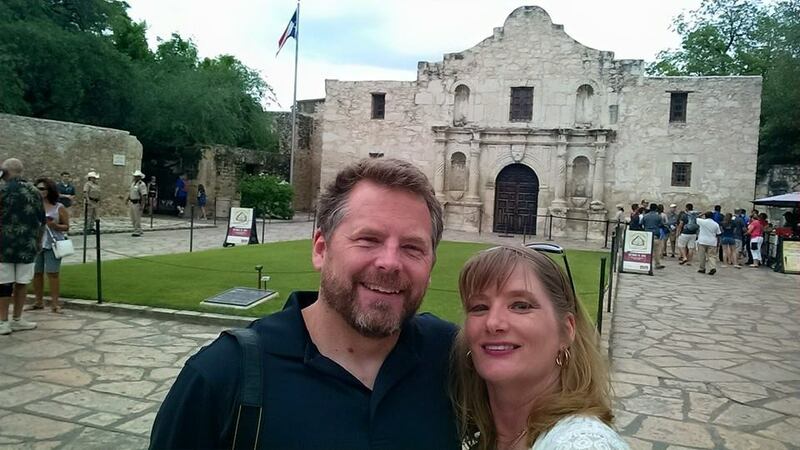 We arrived so early that we had plenty of time to head down to the Alamo and play tourist. The last time Ann was in town she was during her basic training. She didn’t remember the Alamo grounds as being so lush nor could she remember seeing so many tourist -based entertainment (wax museums, Ripleys, etc). 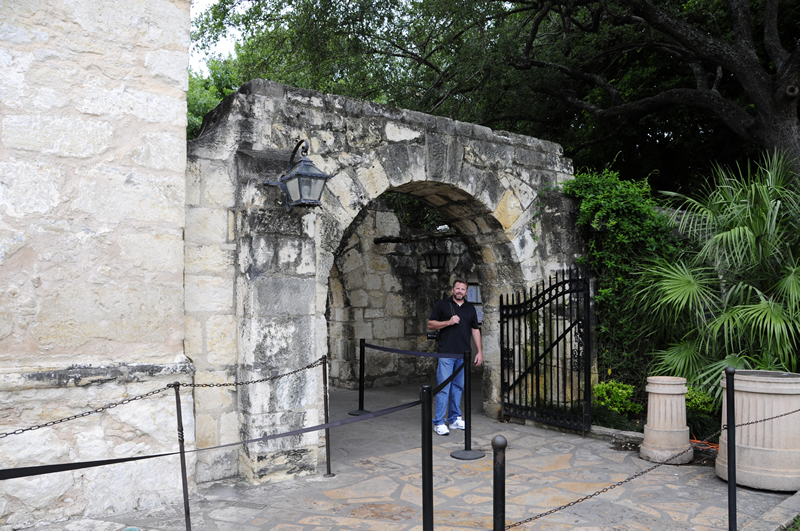 I was expecting the Alamo to have a much more sacred feel, but it’s set up to run LOTS of people through it. As you can see there were no lines while we were there, but it is clear they are ready to handle large crowds. 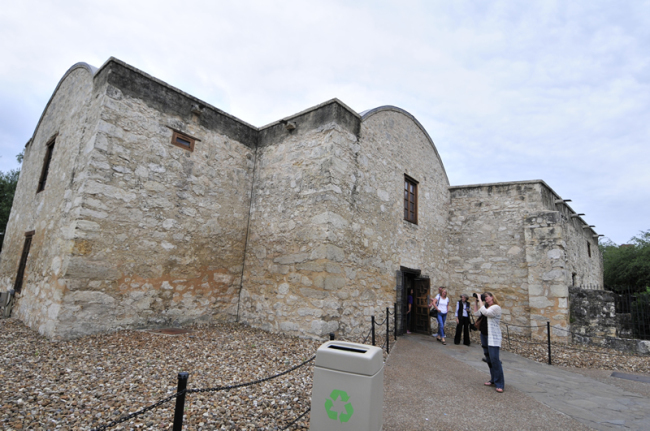 The back side of the Alamo. The surprisingly lush gardens within walls. I was expecting a more desert-like area. 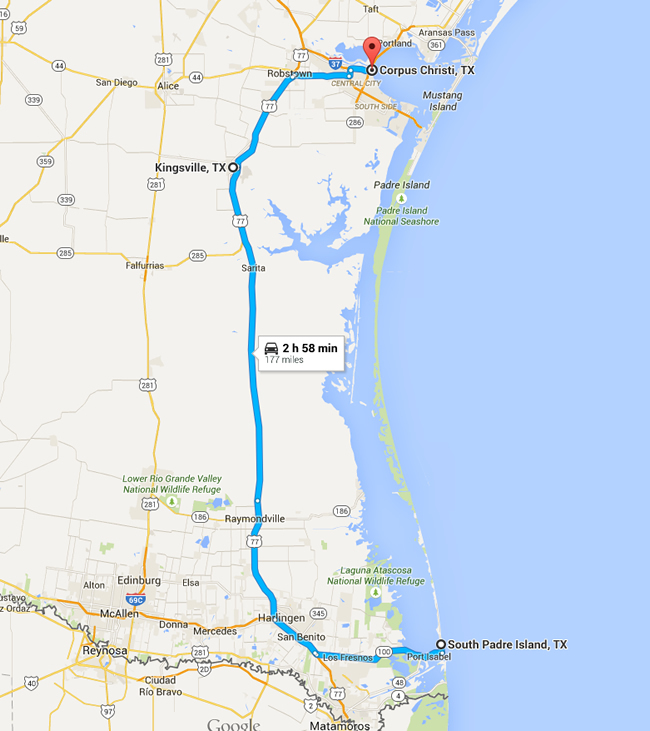 May 5, 2015 • CATEGORIES: Features • TAGS: 2015-Texas-Trip. 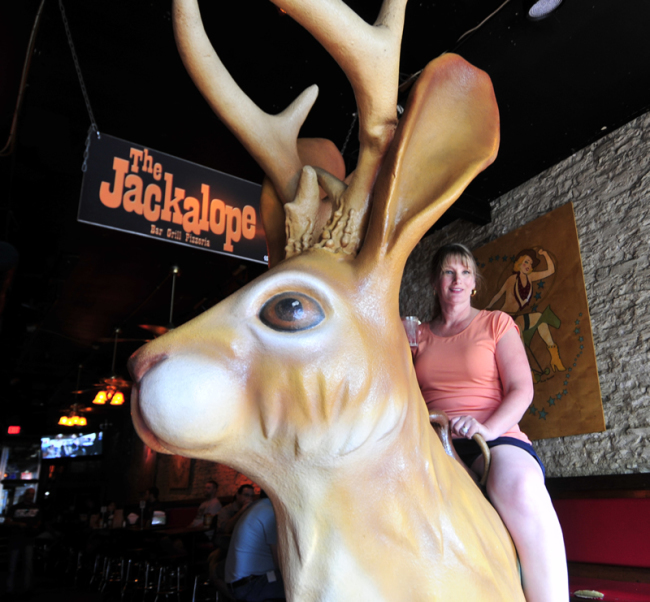 Ann riding a Jackalope with a drink in her hand. Our only plans today were to explore Austin and test out some of the best BBQ Austin had to offer. 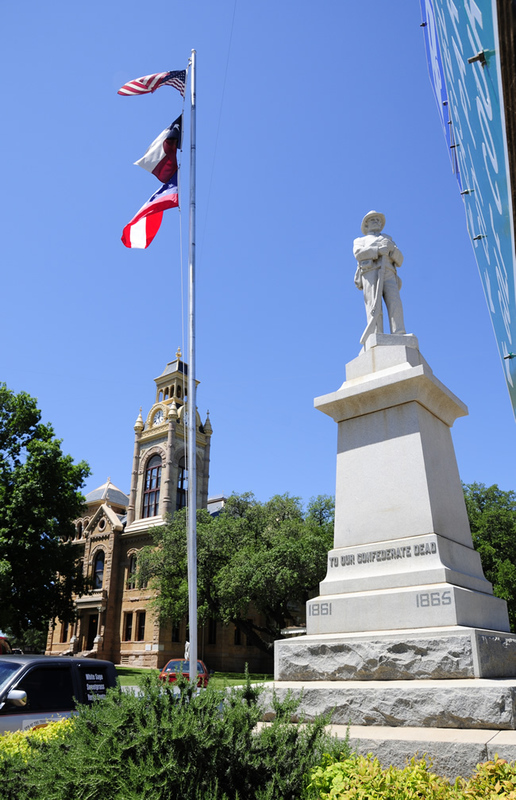 We started by by heading downtown to get some photos of the Texas capitol building. A whole street blocked off at the capitol for motorcycle parking. That plan didn’t quite work out. Apparently, the city was memorializing police officers who died while serving. The capitol grounds were full of officers and people and there were no open parking spaces to be found. One side street was packed with motorcycles. 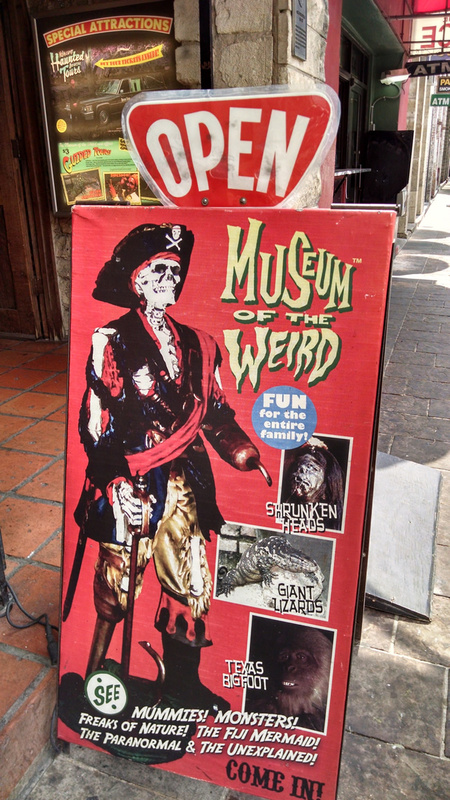 We decided to abandon that plan and head for another option: Museum of Weird. Austin has built a reputation from the city’s slogan, “Keep Austin Weird“. As ‘weird’ as that slogan is, it seems it was not an organic marketing effort, but rather formed and promoted by the Austin Independent Business Alliance. Whatever its beginnings, the city seems to have embraced that mentality, proudly. 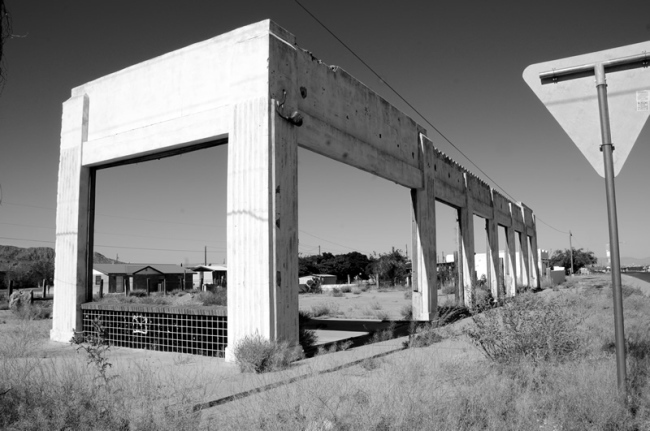 If imitation is the sincerest form of flattery, then Austin ought to be very flattered by Santa Cruz and Portland‘s ‘borrowing’ of the concept. 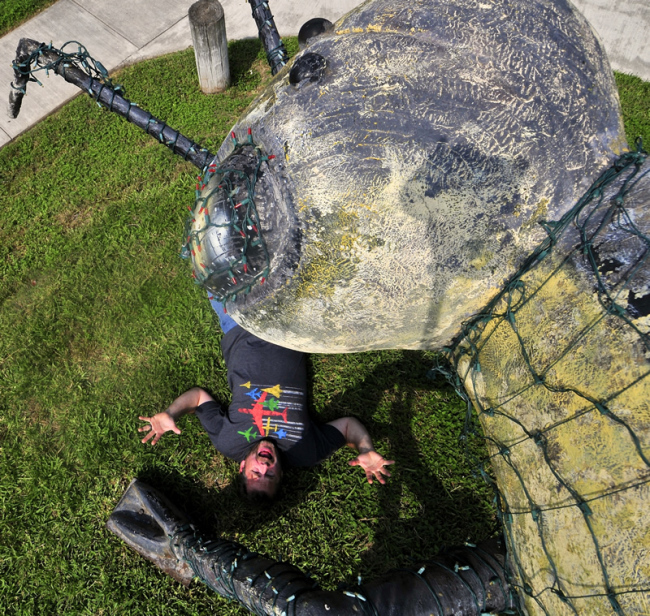 Of the weirder things in Austin is the Museum of Weird. 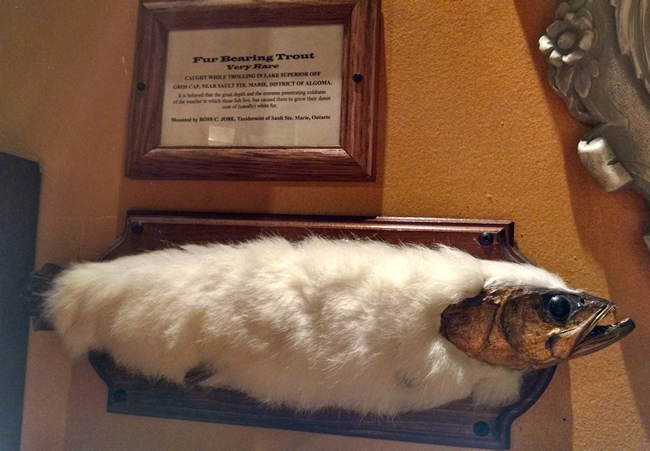 A tribute to the time honored freak shows of yesteryear, the owner of the museum has assembled some odd items. I couldn’t say for sure if they are real or not, but the whole thing was pretty humorous. After paying our money, we walked through a couple short halls full of memorabilia, objects, and assorted freakish things. We were alone, as we usually seem to be whenever visiting museums. This part we expected. 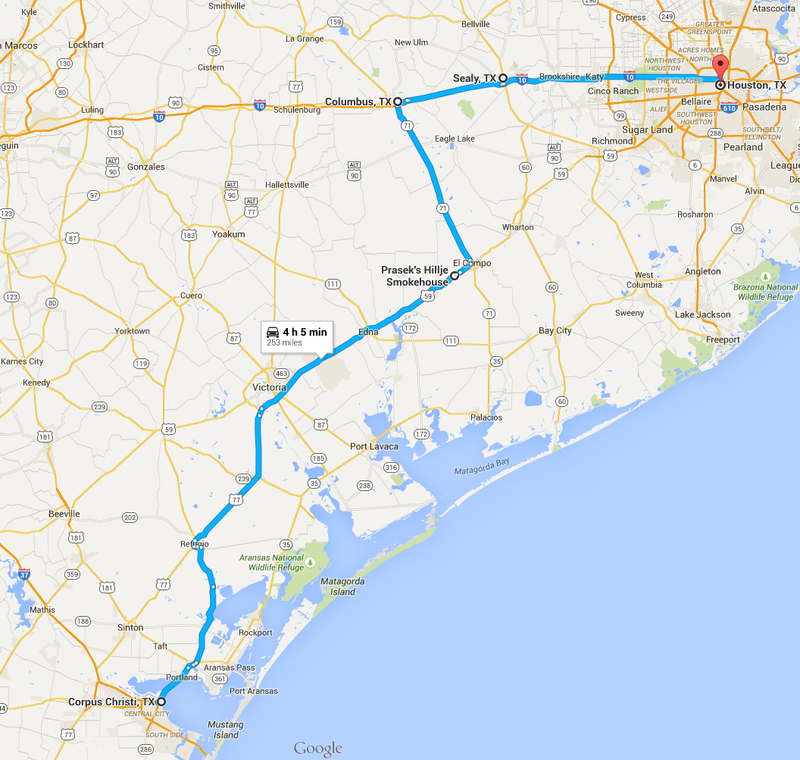 May 4, 2015 • CATEGORIES: Features • TAGS: 2015-Texas-Trip. Any day I see a Tucker is a good day. It was an unexpected pleasure. So, yeah, Sunday was a very good day. Our first stop of the day was to visit the largest Buc-ee’s (and largest convenience store) in the world. 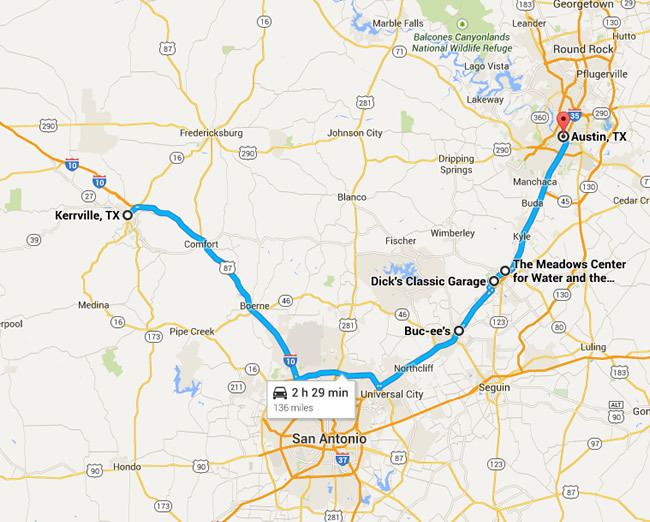 It’s located in New Braunfels. Once again we counted the pumps. 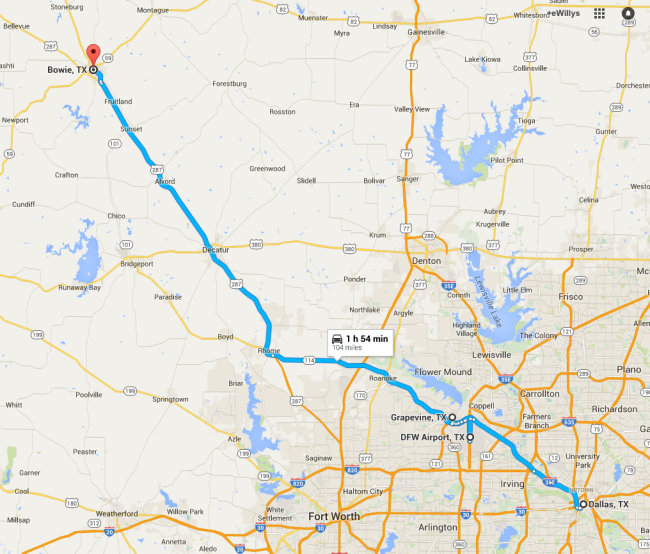 There were 120, which is 8 more than the Temple Buc-ees. The New Braunfels store is 67,000 square feet. 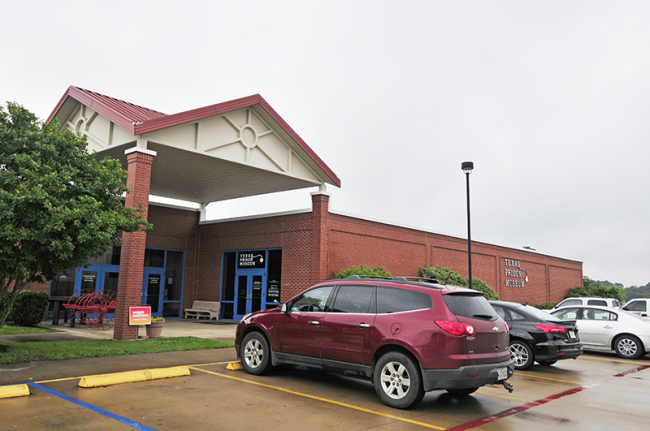 You could fit two average sized Whole Foods stores or 11 7-11 convenience stores under Buc-ee’s roof. There are 83 bathroom stalls, 250 employees, and 1,000 parking spaces, We didn’t take any photos, because it isn’t that much bigger than the new Temple store. 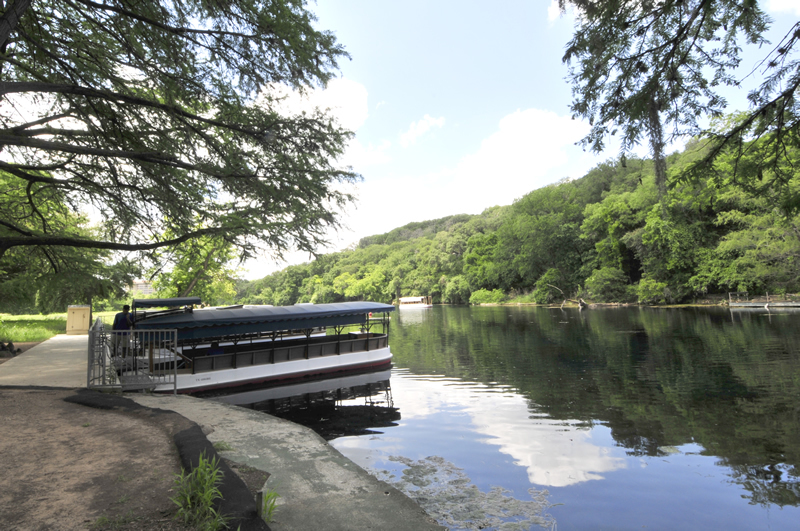 Following our Buc-ee’s fix we motored northward on I-35 until we reached Texas State University’s Meadow Center, home to glass bottom boat tours at the headwaters of the San Marcos River. 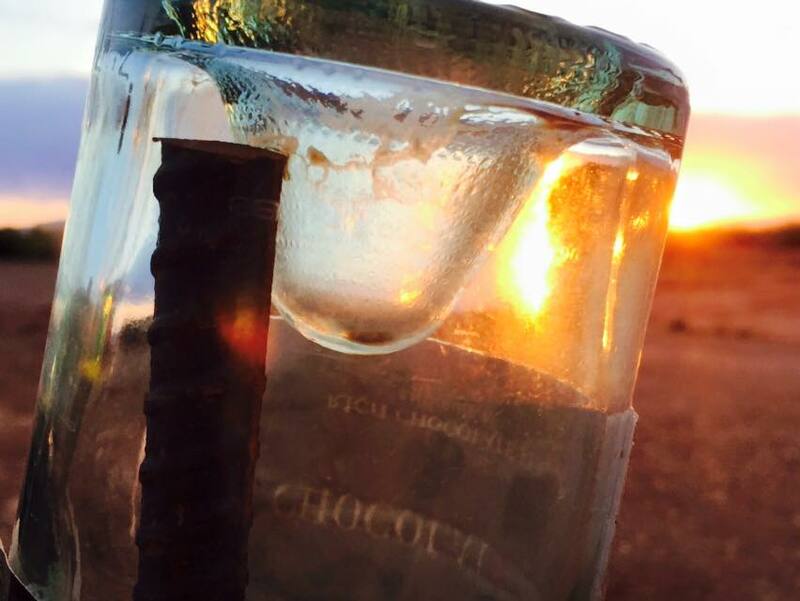 When Spanish explorers first found the area they thought it was the fountain of youth due to the bubbling fresh water. In some cases the water spurted out like small geysers. In 1849 the lake was dammed. For decades the lake was known for the Aquarena performances and theme park attractions. 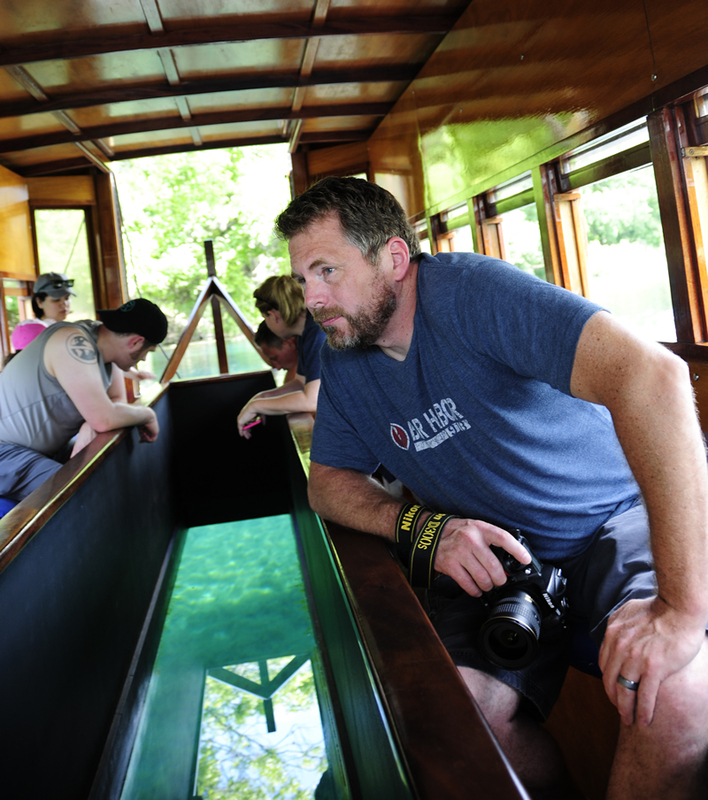 Eventually, the theme park was shuttered, but glass bottom boats still explore the crystal clear lake sharing its history and educating visitors about the unique environment. Through Groupon we got a buy-one-get-one free deal, so if you decided to go, check them out for the discount. The boat operator was full of information and we enjoyed the tour. One tip, on weekends parking is free. The dammed lake is long and narrow. The water is very clear. It appears they have four boats that operate every half hour. We photographed the lake bed through the glass bottom, but all perspective was lost. This demonstrates how visitors look down through the glass. I’m not looking down. I am posing for a photo, but it seems I should be posing by looking down? After our boat ride we decided to check off another to-do item. We visited Dicks Classic Garage Car Museum. 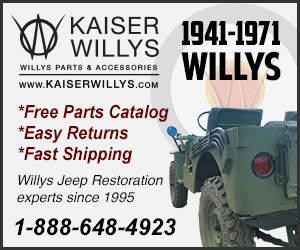 I’d decided to visit the museum, because it was one of the few car museum in Texas I could find. 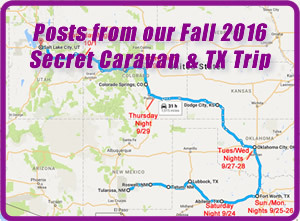 May 3, 2015 • CATEGORIES: Features • TAGS: 2015-Texas-Trip. 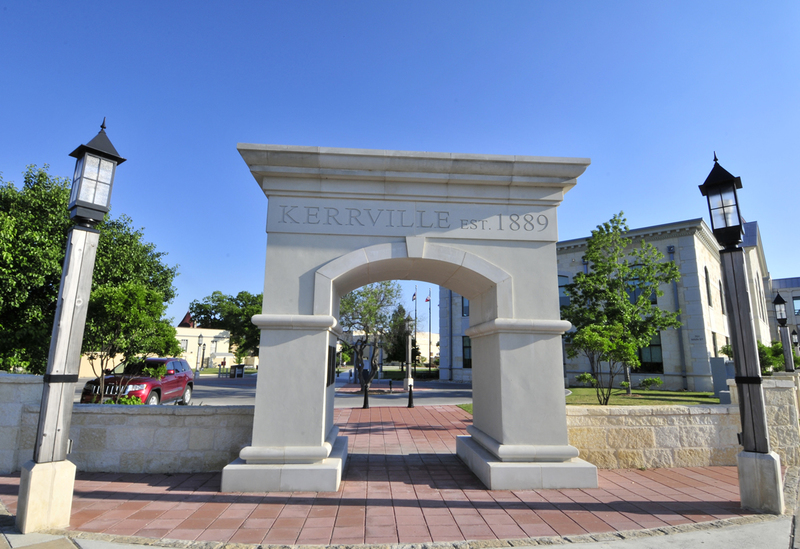 Kerrville, a pretty neat town. Today was a ‘day’ off. It was supposed to be an easy, fun day. 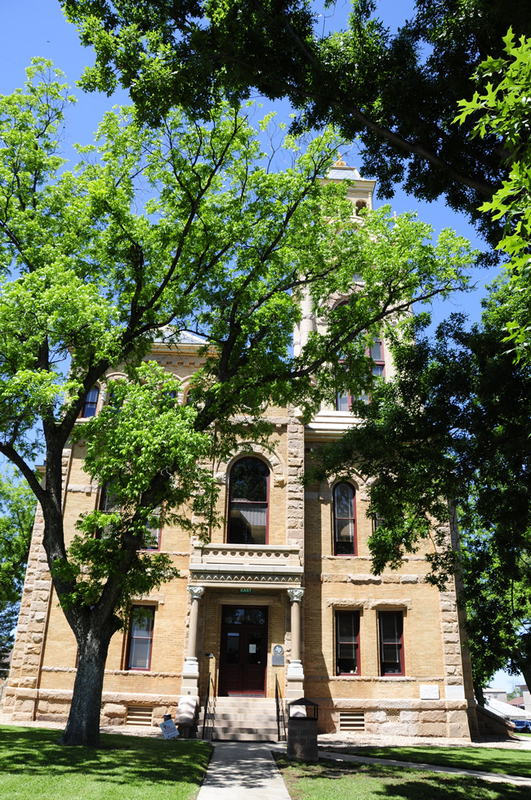 Yet, we still found ourselves at a few cool places in the otherwise semi-sleepy town of Kerrville. We arrived at Kerrville on Friday out of sheer fate. Well, fate and careful motel hunting. Our plan was to land in Austin Friday night, but the weekend rates were pretty unfriendly for an otherwise friendly state. 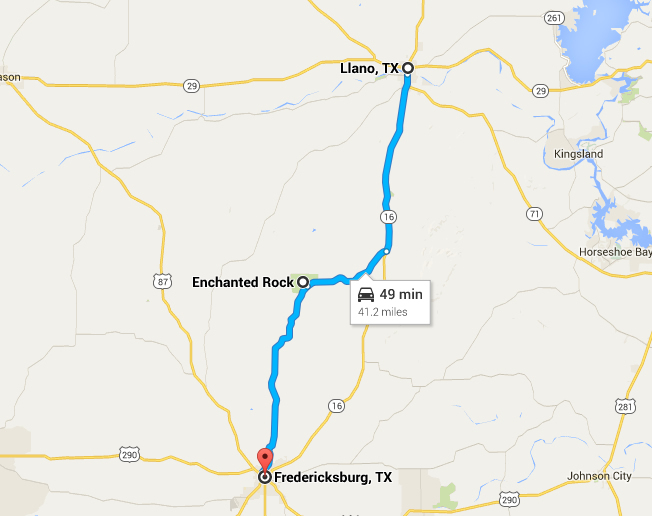 Fredericksburg rates were much better. 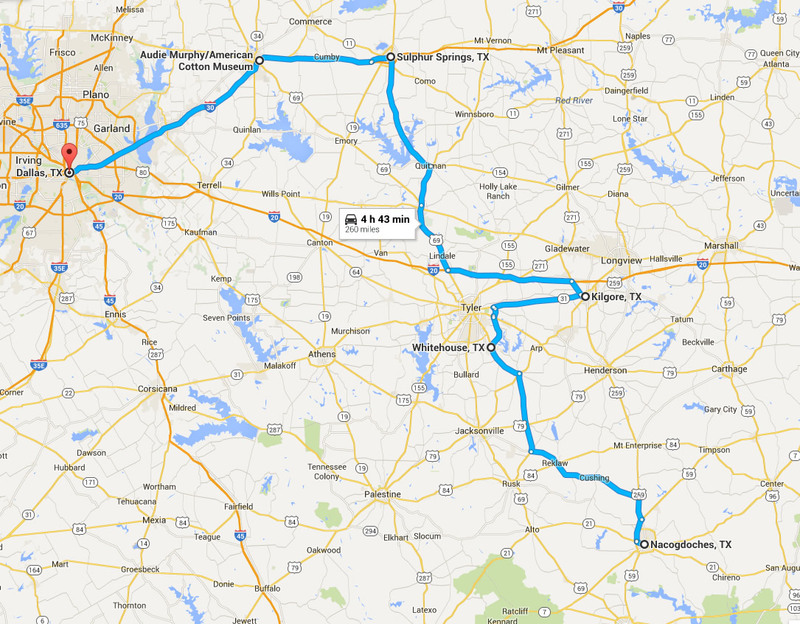 So, using Priceline I found myself veering over to Kerrsville. Someplace called the YO Ranch was serving up some rooms at $62 for Friday and Saturday. 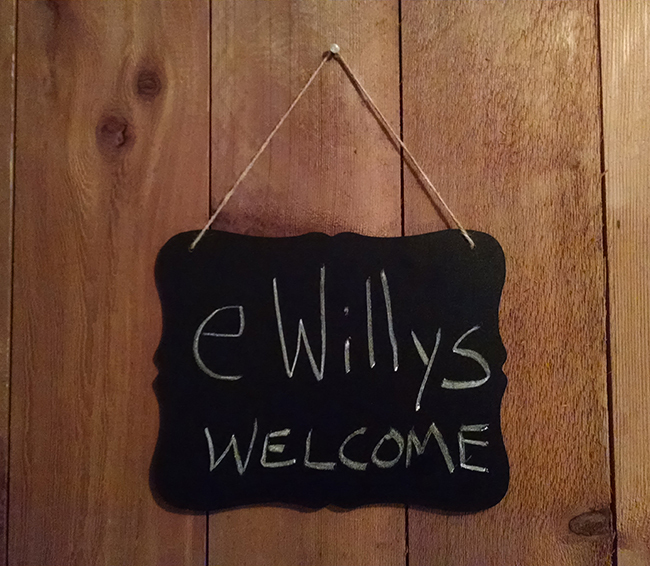 That was a bargain for a weekend rate, so I went for it. 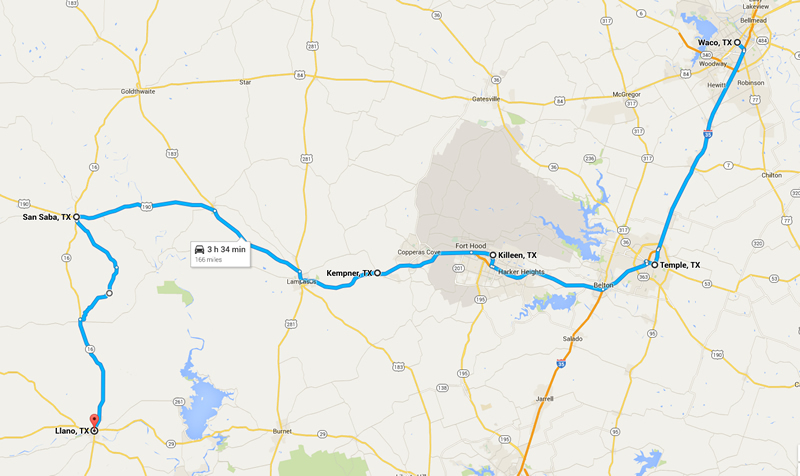 I figured since we’d never been to Kerrville that maybe there’d be something interesting there. It turned out that this YO Hotel place was really cool! 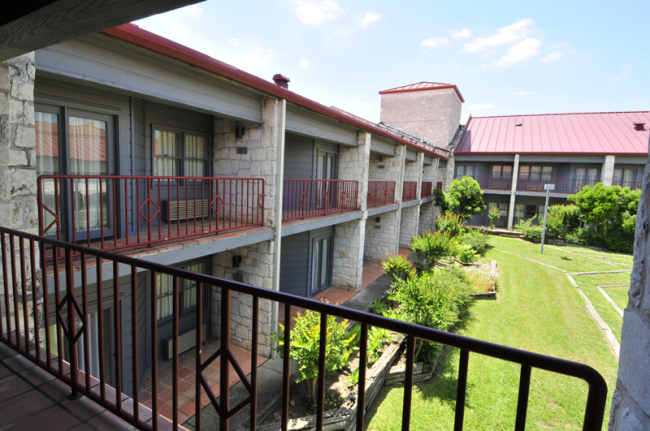 Check out the interior and exterior shots. 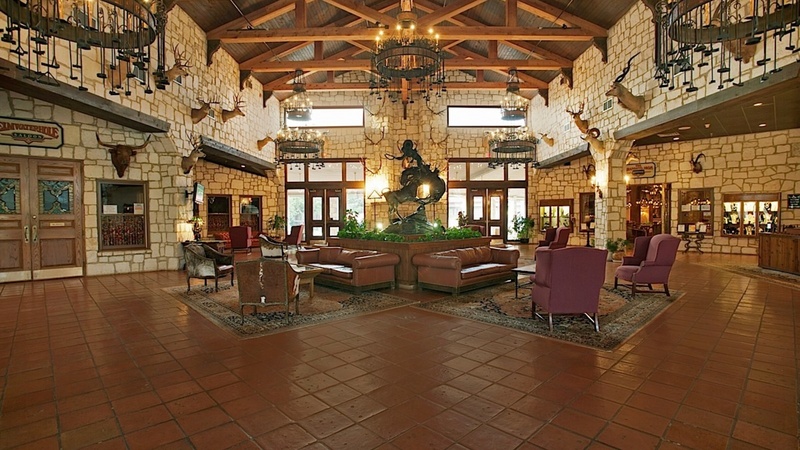 Lobby of the Y O Hotel. Dangling off the chandeliers are all the brands of ranches that sent cattle from southern Texas to the panhandle (or so they say). We even have balcony attached to our room. On Saturday morning we awoke and went hunting for a laundromat. I normally travel with a week of clothes. I can always tell when the week is up, because my the rear of the jeep smells like a gym locker. I don’t know how my wife stands it. I guess it is true love after all? 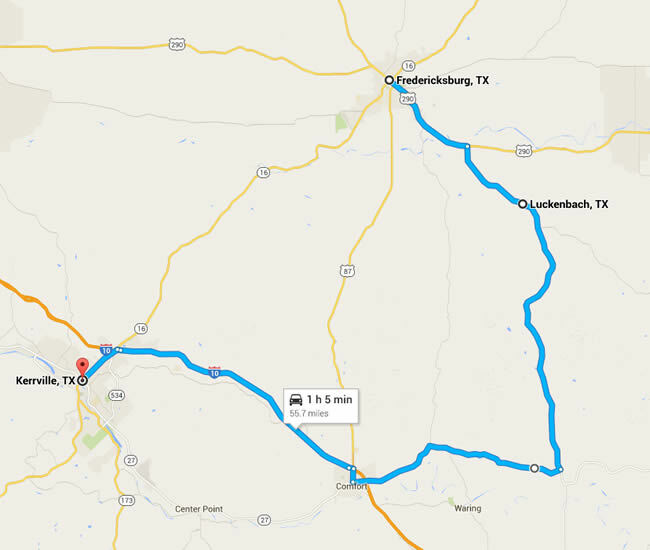 May 2, 2015 • CATEGORIES: Features • TAGS: 2015-Texas-Trip. 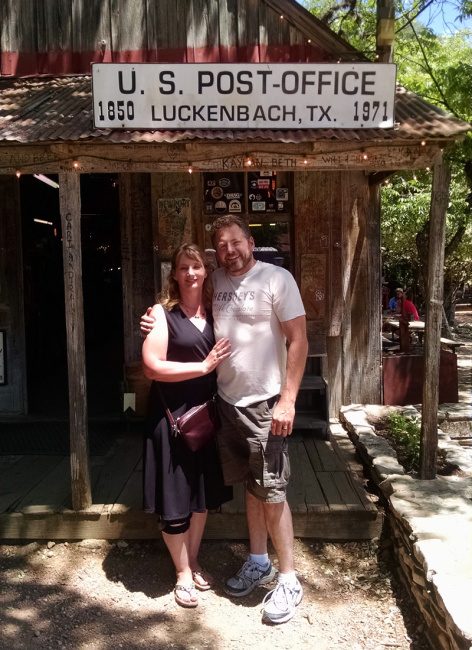 Ann and I checking out Luckenbach, Texas. We didn’t see Waylon, Willie, or any of their boys. After a good night’s sleep at James’ B&B, we took a few photos and hit the road. Our first stop was downtown to meet up with James. We both got so busy that we hadn’t had a chance to meet in person. James strongly recommended that on our way to Kerrville, where we planned to hold up for a couple days, that we stop by Luckenbach, Texas. 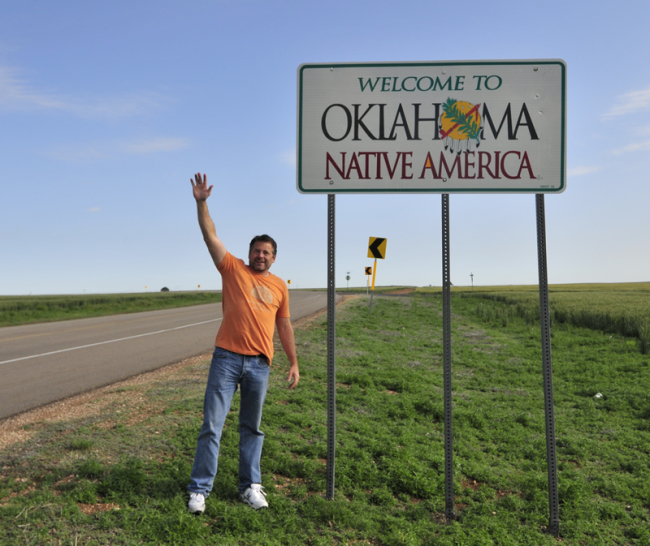 Of course, Waylon Jennings and Willie Nelson made the town famous in their song. That was all Ann or I knew of the town, so we were all in for that adventure. We made a quick stop in Fredericksburg at the Nimitz portion of the National Museum of the Pacific and learned about Nimitz’s early life. However it was too dark to get any photos inside. 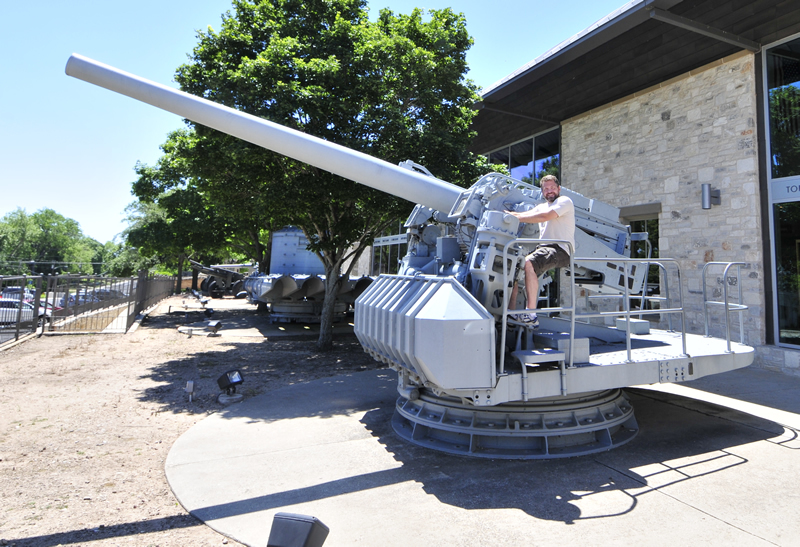 We settled for some photos of us operating artillery. Luckenbach is only six miles or so south of Fredericksburg, It didn’t take us long to get there. 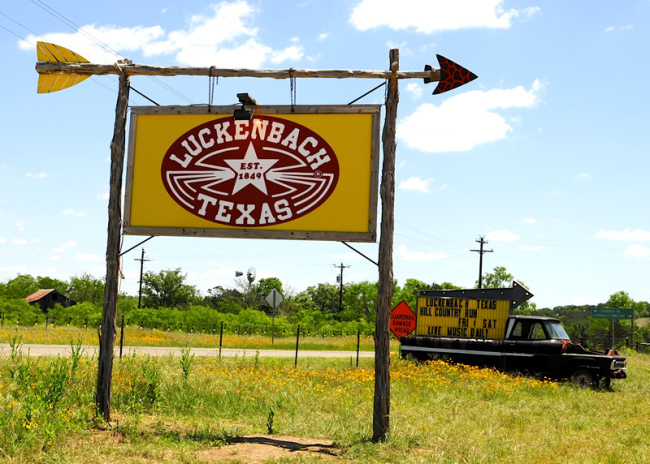 After some confusion about where Luckenbach was, we finally figured out (with some help) that the main loop into the town was closed for a bike rally, so we had to park nearby and walk to the town. 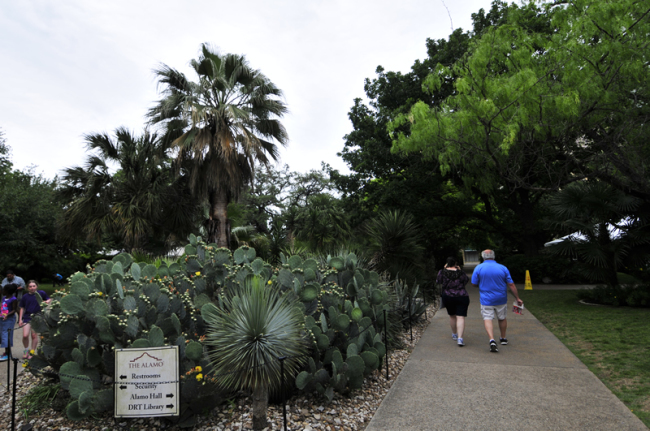 May 1, 2015 • CATEGORIES: Features • TAGS: 2015-Texas-Trip. We didn’t have much driving to do today, but we still managed to use up the time we had. 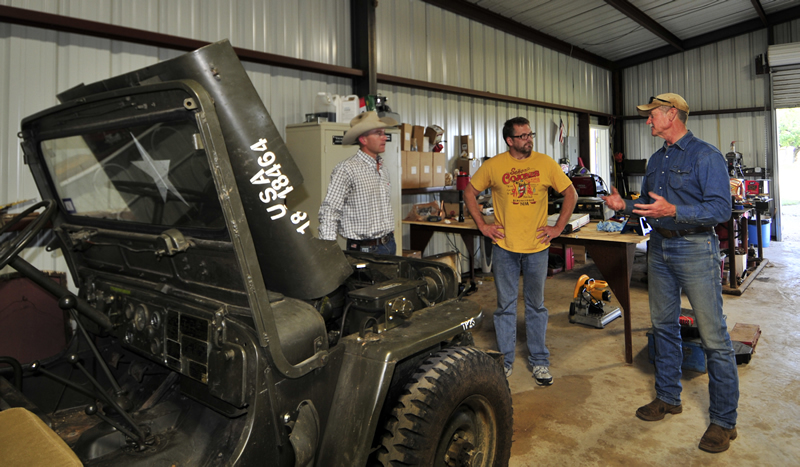 Thursday morning we met with Texas Justice, or more accurately the Justice of the Peace in Llano County (the name is pronounced ‘lah-no’). Normally, we get hauled into court, but this time we went of our own volition to meet with Brian Alexander. Brian’s been interested in jeeps since he was a kid working at his uncle’s camp, a long stone’s throw from downtown Llano. 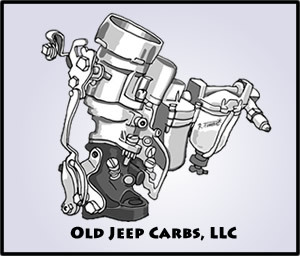 He remembered the camp owning an early column shift CJ-2A, but then they switched over to floor-shift models. 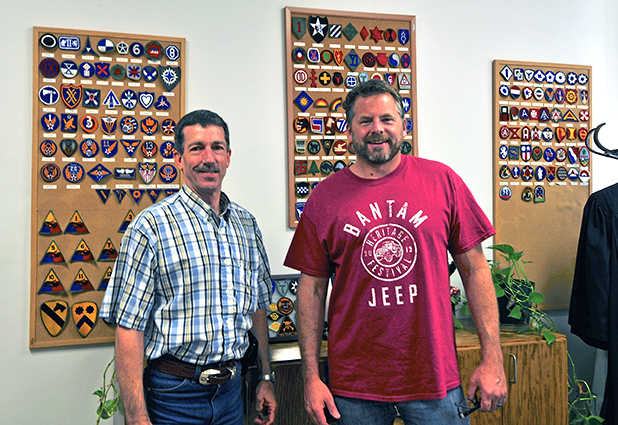 Eventually Brian moved to Odessa, where he enjoyed a career in law enforcement, before moving back to Llano and winning election and re-elections as Justice of the Peace. 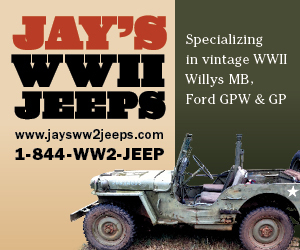 Along the way Brian, always a military buff, got involved in reenactments and WWII history. 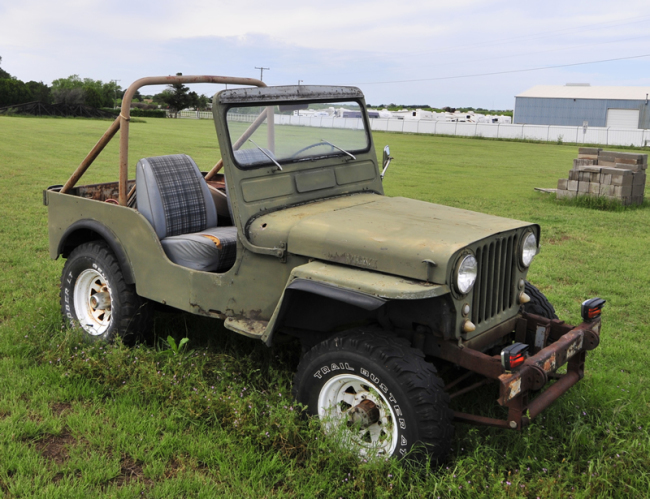 For years Brian was interested in owning a jeep, but the stars didn’t align until a 1951 CJ-3A fell into his lap. It needed some work, so he’s been rebuilding it. The project is nearly done. 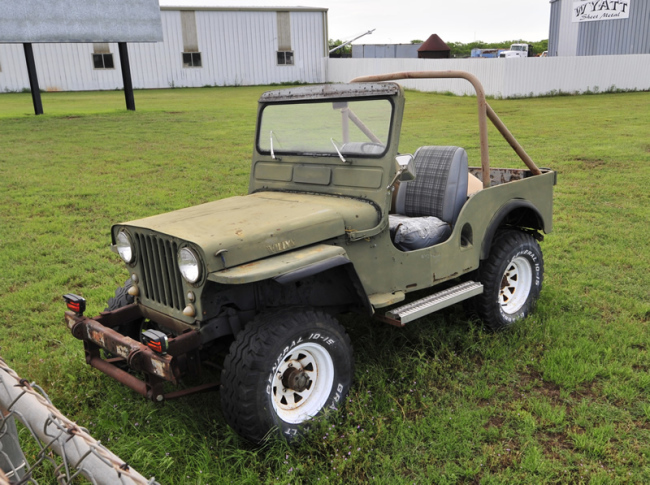 When finished, he plans on selling it and getting what he’d really like, an MB or GPW (well, and a M-38, and a M-38a1 — why just have one, right?). Brian seems to have a good knack for details, so I suspect that once he buys an MB or GPW, he’ll end up restoring it, because not having the correct steering wheel or some other detail will gnaw on him until he does have it right (Brian, that’s my prediction 🙂 ). 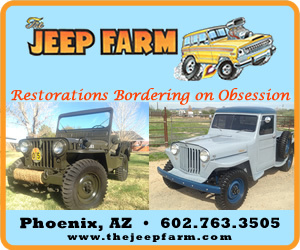 We had a real nice time talking with Brian about jeeps and about his interests beyond four-wheel-drive, so we thank him for his time. Also, Ann and I need to apologize to the people of Llano County for bringing the wheels of justice to a halt at least for a couple hours Thursday morning. Another shot of the square. April 30, 2015 • CATEGORIES: Features • TAGS: 2015-Texas-Trip. 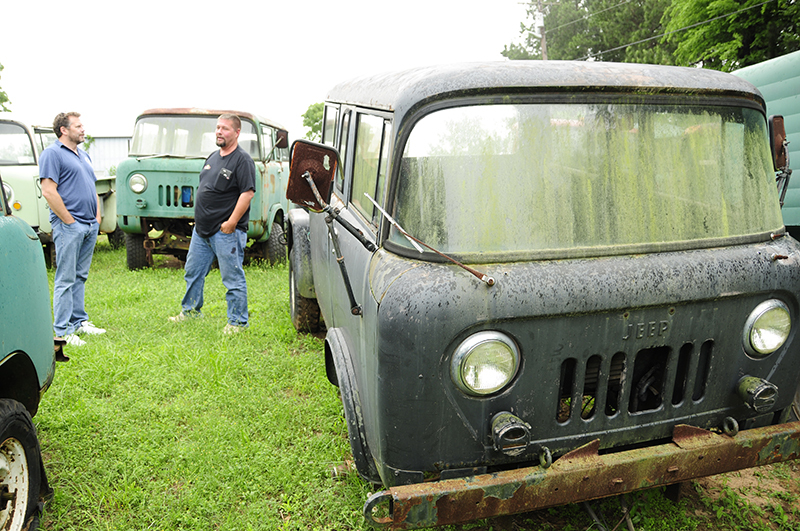 Talking about jeeps and life with Lee (left) and his father Sam (right). 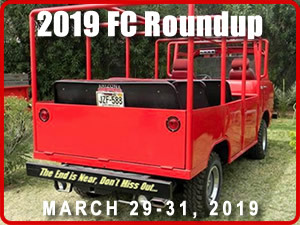 Great day today that started with a question mark … Would Paul Cook respond to my request to see his Power Wagons before we passed Kempner on our way to San Saba. I had contacted him at the last minute, so I wasn’t assured he was available. Since we had nothing else planned, we just went with the flow and hoped Texas would surprise us with something. 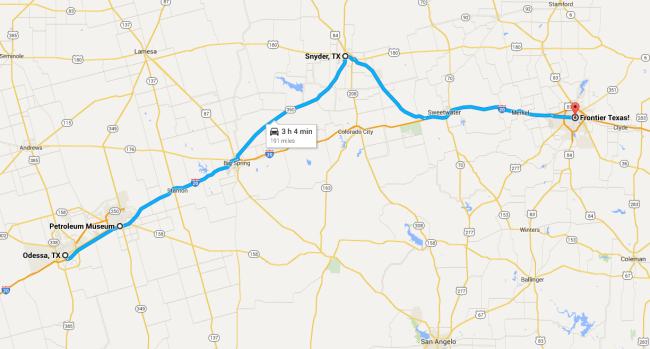 Around 11am we were driving south toward Temple, Texas, when I saw a sign for Buc-ee’s. Then I looked across the freeway and saw a giant beaver head with lots of triangle flags, which I believe is the international symbol for ‘Hey, we’ve just opened so come over and take a look!’. I asked Ann if she knew what a Buc-ee’s was. She didn’t. I didn’t, but told her we were going to find out! So, we took the exit and drove across the freeway for our first ever Buc-ee’s experience. 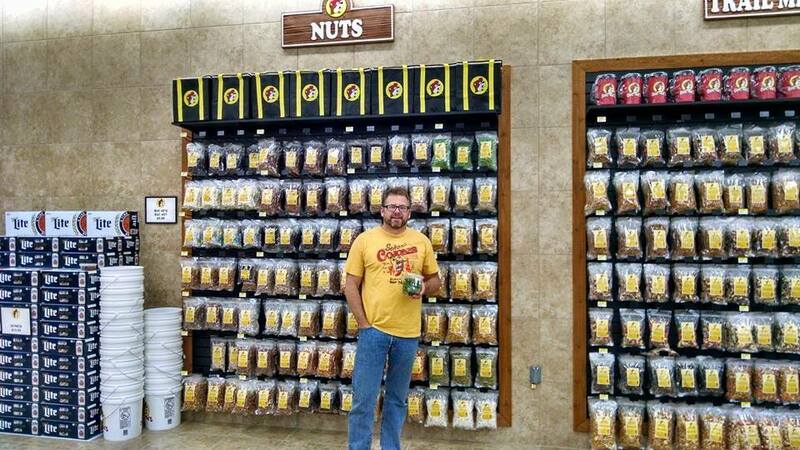 You really have to see a Buc-ee’s to believe it. HUGE! Our jaws dropped as we pulled into the massive parking lot. This was supposed to be a gas station/convenience store, but it was enormous. 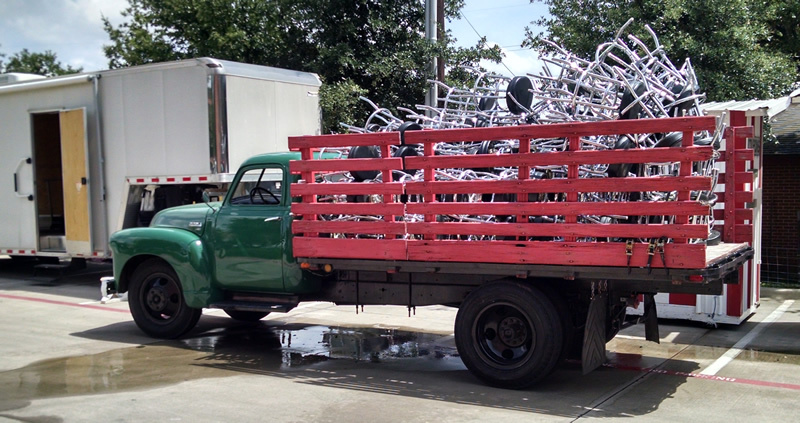 It was so big it seemed like it took an hour just to circle all 112 fuel pumps (yes, we counted them). As many of you know, Ann and I have been through many states in the last few years, but this Texas-sized gas stop was the biggest one, by far, that we’d ever seen. We were even more surprised to learn this was the 35th store. I’m just one of the many nuts in the store. That’s a LOT Of picked eggs. 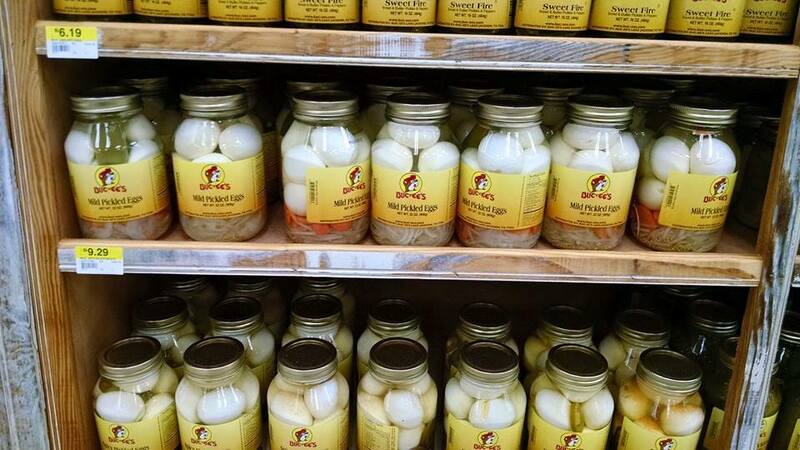 I might still pick up a jar of those. April 29, 2015 • CATEGORIES: Features • TAGS: 2015-Texas-Trip. 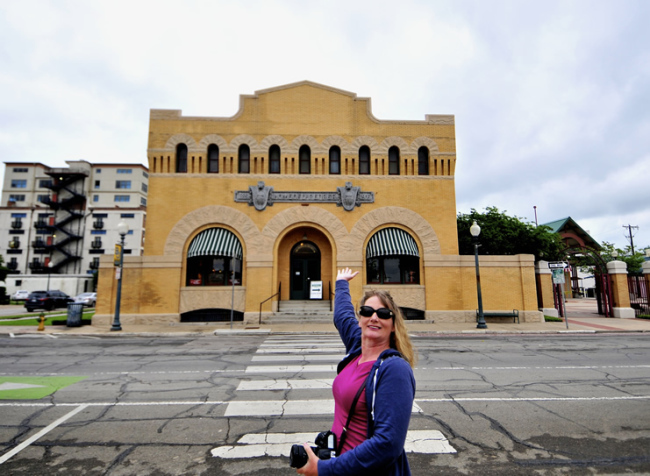 Dr. Pepper Museum in Waco, Tx, and a happy Dr. Pepper fan eagerly waiting to venture inside. We had big plans for Tuesday morning. Our first stop was going to be the outdoor historic village of Buffalo Gap. So, when I hopped out of bed at 7:30am and saw that it was raining, we quickly changed that plan. Without feeling rushed, we somehow didn’t get out of the room until 10:30am. 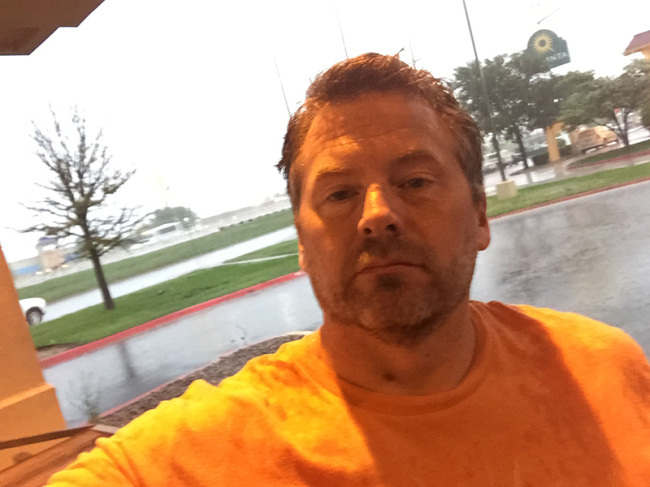 The rain was gently falling as we got onto eastbound Interstate 20. Soon we turned southeast on highway 6. If there’s one thing I like about these Texas state highways it is the speed limit: 75mph. That’s faster than any of the speeds on Oregon’s inter estates. 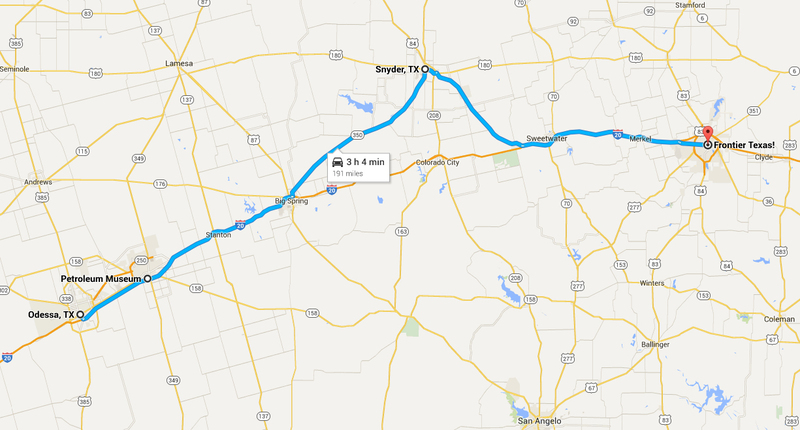 You can get places in Texas, however the places are so spread apart, that even at 75 it doesn’t seem fast enough. 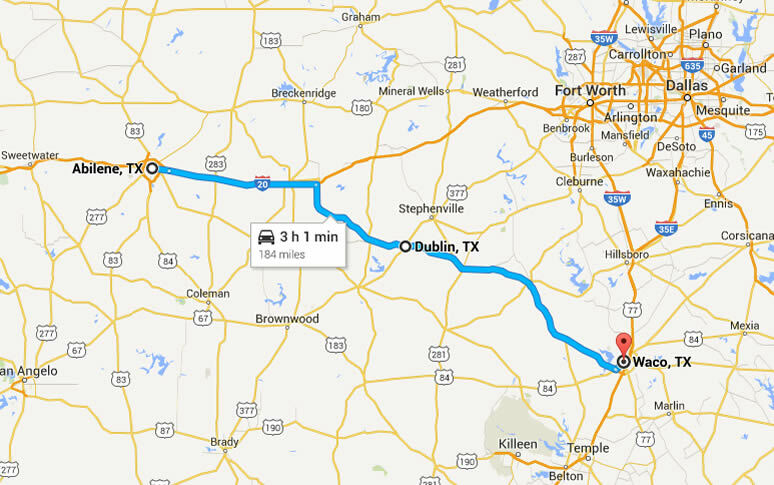 Eventually we reached Dublin, Texas. 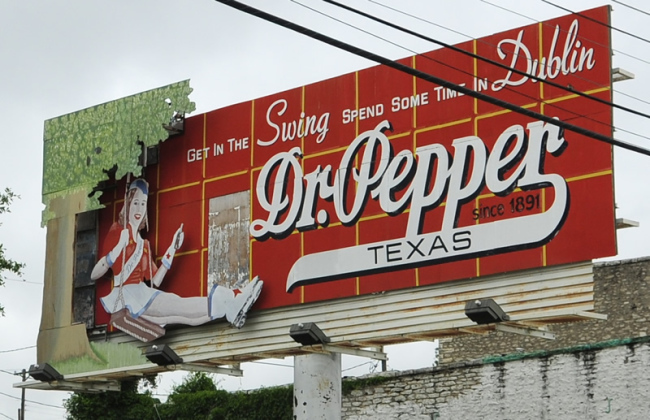 I spotted a cool Dr. Pepper sign and asked Ann if she’d like a photo of it. She agreed, so I did a loop around the block, We weren’t halfway around when we ran into several more Dr. Pepper signs. Then we spotted a Dr. Pepper museum reference. That’s when the light clicked for both us. We both remembered reading that besides the Dr. Pepper Museum in Waco, there was a second one in a small Texas town. This was it. This is the billboard I spotted while driving through Dublin. Feeling lucky, we jumped out of the jeep to see what this was all about. We learned that Dublin was home to the first Dr. Pepper bottling plant. The Dublin plant used cane sugar in all their soda pop products, including Dr. Pepper, even when the rest of Dr. Pepper world switched to high fructose corn syrup. This fact angered the Dr. Pepper company, so the company revoked Dublin’s right to bottle and sell it. 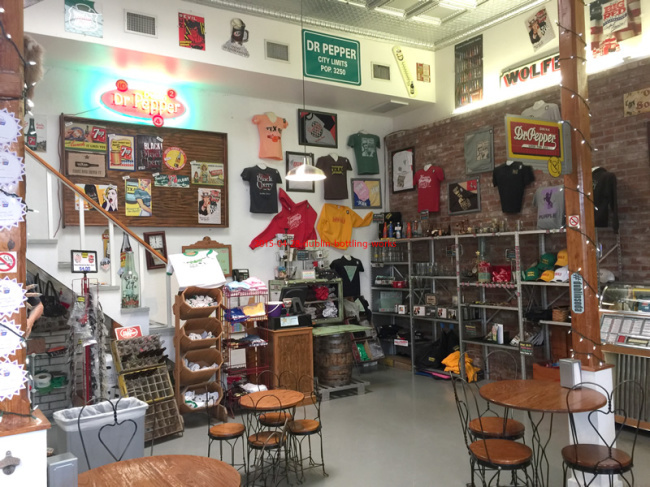 Now, the Dublin Bottling Works bottles and sells a variety of custom flavors and sells them all over the country. 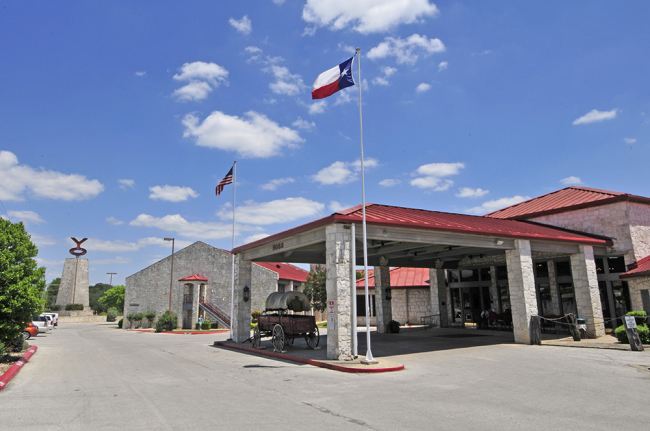 April 28, 2015 • CATEGORIES: Features • TAGS: 2015-Texas-Trip. 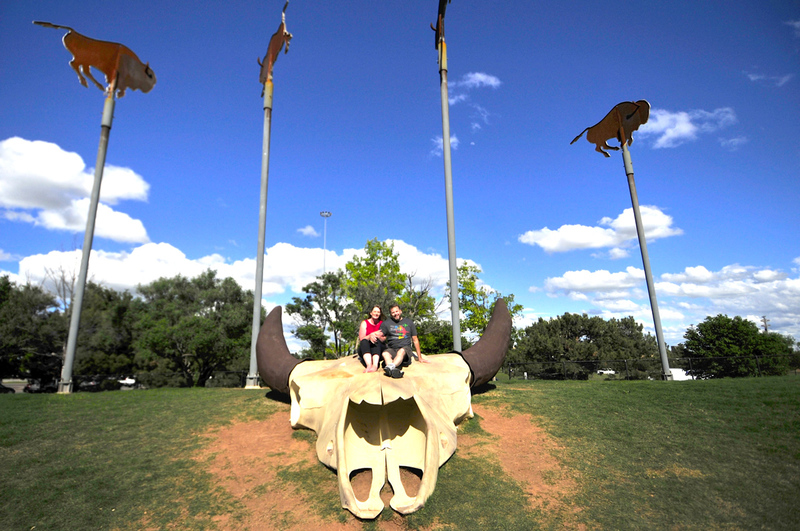 That’s us sitting on a giant metal skull at the Frontier Museum. Above us are Buffalo that pivot like weather vanes. On Monday morning we awoke planning to reach Waco, but we got side tracked by an errant attempt to locate a Best Buy so Ann could buy a lens cap. I won’t go into the machinations of locating one, even when trying to use both of our ‘smart’ phones, or how we eventually (and accidentally) stumbled upon one and how we were so surprised that my wife did an all-too-quick u-turn in the street, dumping a rather sizable container of ice-cold water into my lap. No, you don’t want to hear all that! And, I’m really sure that after you read this sad tale, and after you learn what it took to get the lens cap, and when you understand just how wet my underwear and shorts were, you’ll acknowledge the personal sacrifice I made in the cause of the lens cap, and only then can you appreciate that three hours after we bought the lens cap I accidentally dropped it onto the ground — it broke, into several pieces … uggghh!!! Instead of that long, sad tale, I will give my impressions of Monday morning in Odessa. There were many men around our motel dressed in heavy one-piece work outfits. They all worked for energy companies with bland sounding names. All drove white trucks packed with tools in the back and with catchers on the front that could move an entire herd of cows. On Sunday evening they had all looked tired from a long day; most were gone by Monday morning, but not before eating up all the available breakfast that our motel served that morning. They did manage to save me a piece of sausage. We were out of the motel room by 9am. As we drove through Odessa, my view was industrial buildings, piping equipment and oil rigs everywhere. The equipment suggested people here worked hard. My other impression was that land is cheap, or at least was cheap. All the endless industrial companies we passed on Monday morning on our way to nearby Midland seemed unconcerned with how they organized their stuff. Stacking didn’t seem to be a concern, as everything was horizontal. Space was cheap, stacking wasn’t necessary. 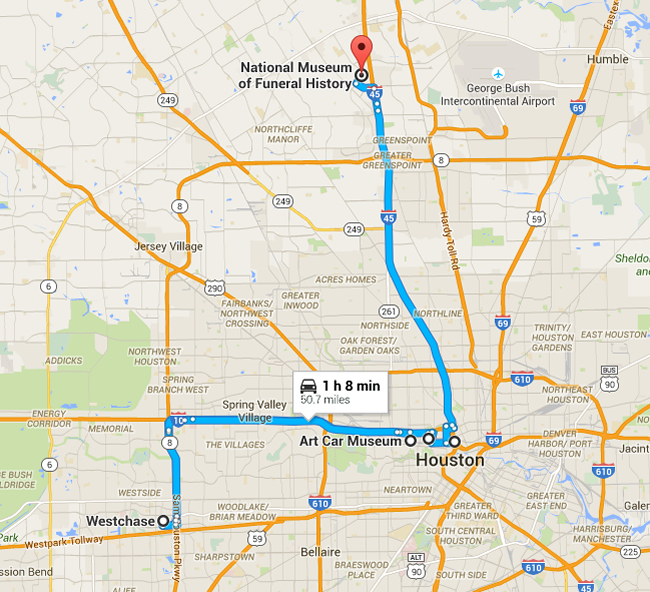 Those were the thoughts that bounced around my head as we drove to the Petroleum Museum. 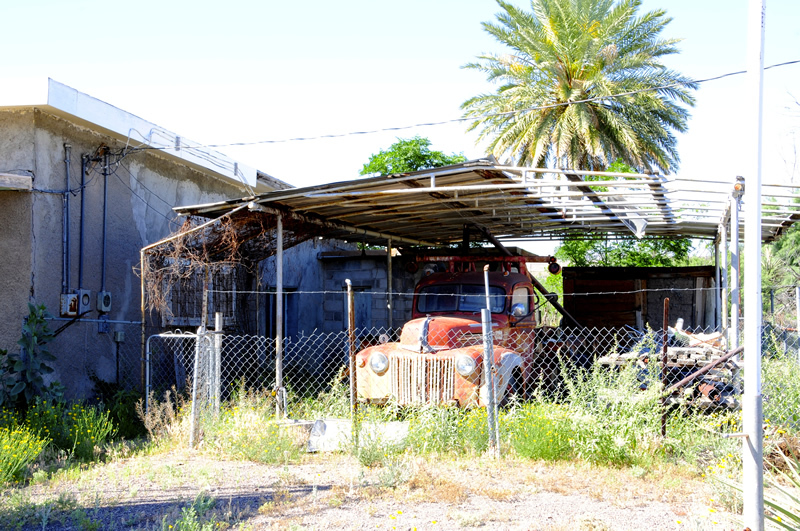 Near the entrance to the Petroleum Museum. 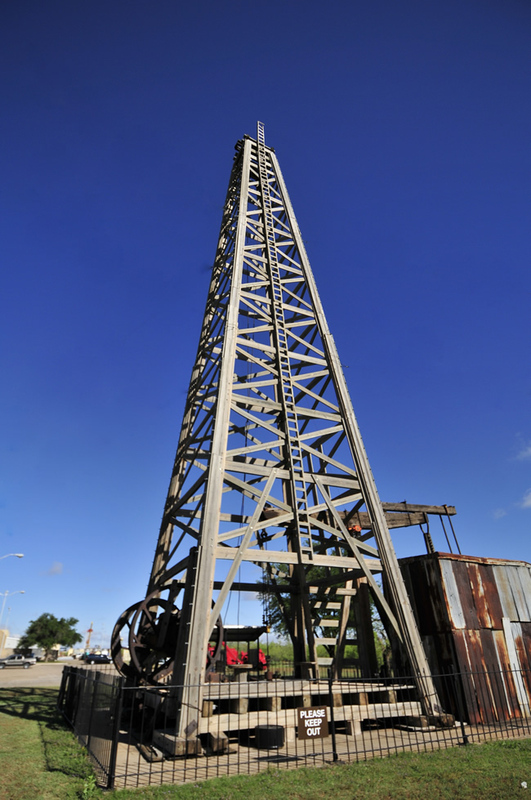 We arrived at the Permian Basin Petroleum Museum just after it opened. When we entered the building we were told that the entire history portion of the museum was undergoing an $18 million dollar remodel. Obviously that wouldn’t do us any good, but they did have a few exhibits — gems, paintings, and race cars, that we could view. Since were were there, we wandered around and looked at those for a short time. However, I really wished we could have see the main oil history exhibit. 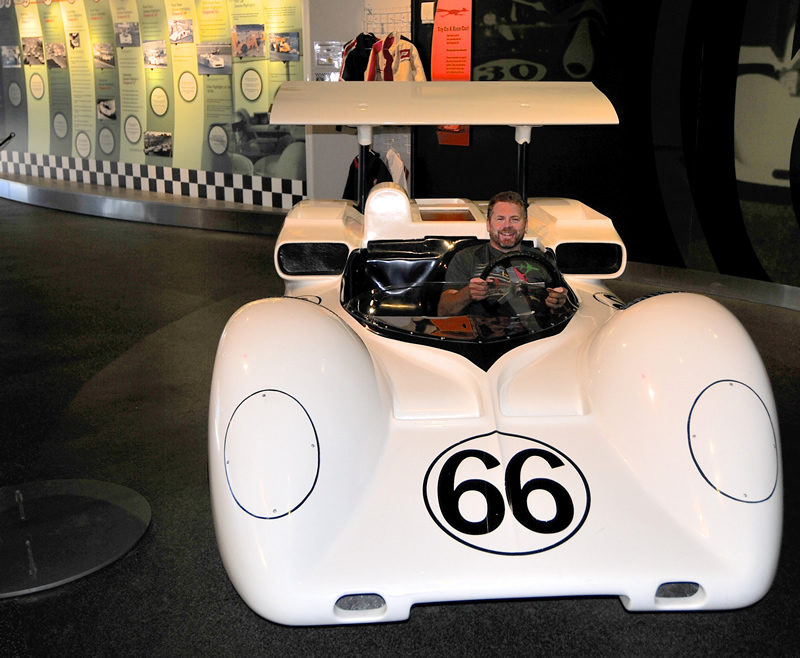 Me pretending to drive one of the race cars. I didn’t fit very well, especially not on the driver’s side! I hope they didn’t mind me removing the steering wheel . . . . 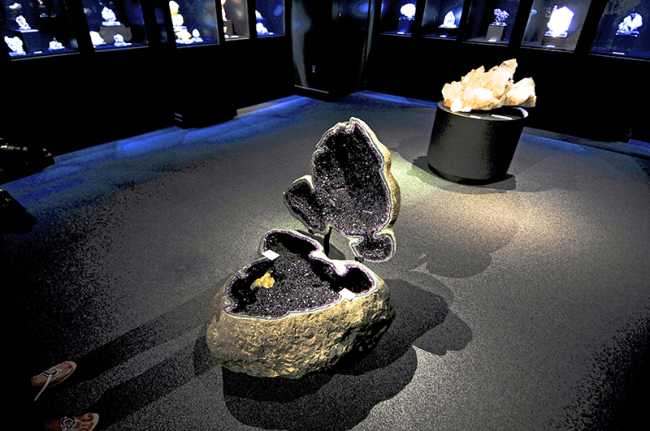 The mineral exhibit was interesting, but shamefully I know very little about them (where are my ancestors when I need them??). April 27, 2015 • CATEGORIES: Features • TAGS: 2015-Texas-Trip. Today we drove and drove. 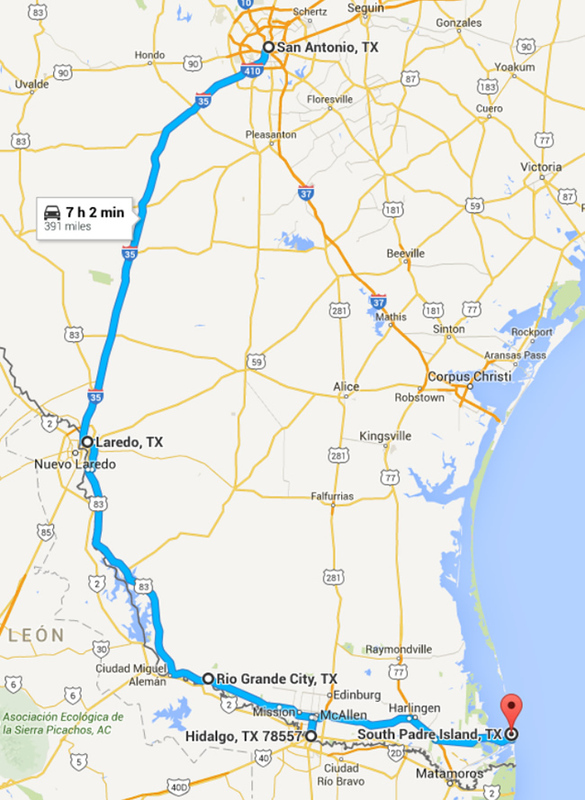 The first part of the trip took us south toward the Mexico border at Presidio, Texas. 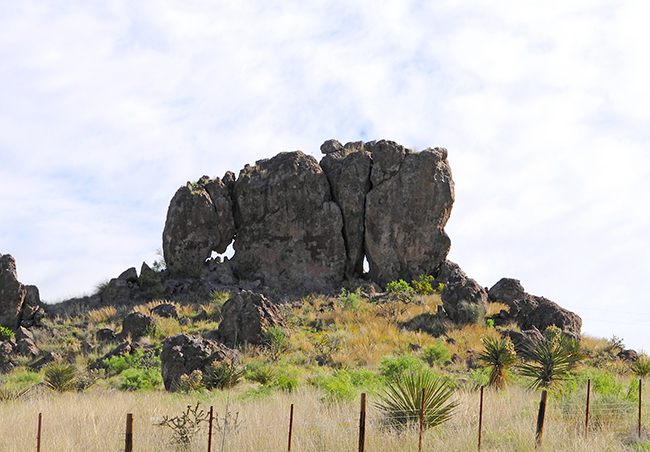 Along the way we encountered ‘Elephant Rock’, which we felt lived up to its name. Called Elephant Rock for an obvious reason. 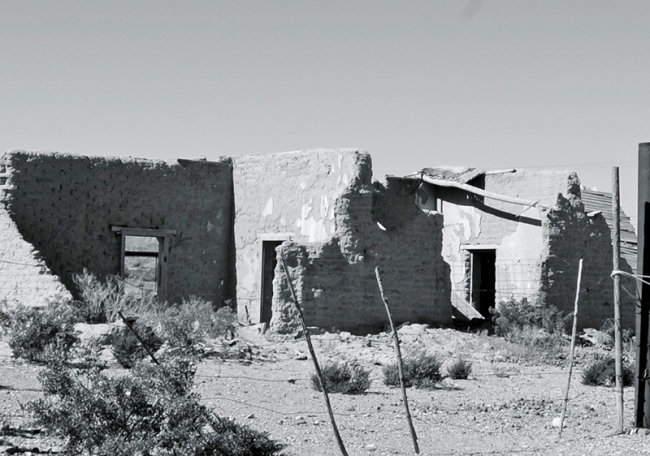 Eventually we reached Presidio, a dusty dry border town, I am not entirely sure what the appeal is for living in that area. Looks like plenty of shops and stores were out of business. April 25, 2015 • CATEGORIES: Features • TAGS: 2015-Texas-Trip. When you are in Tularosa, it is easy to go nuts for pistachios. 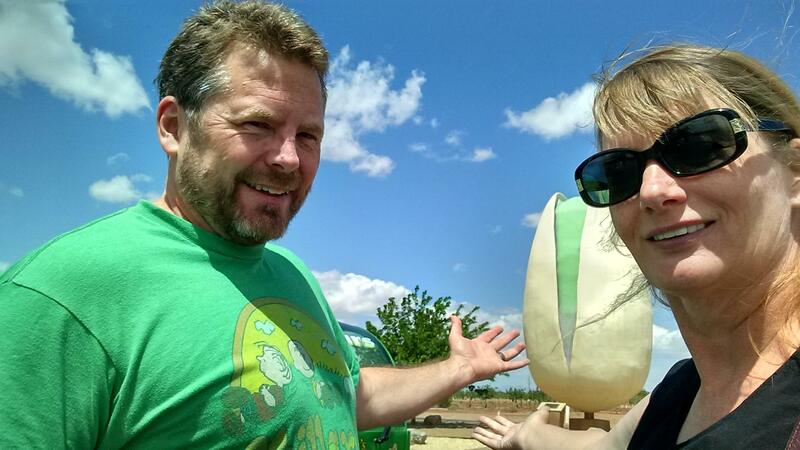 Before we left Tularosa, we made sure to stop by and ham it up in front of the world’s largest pistachio. Our first and only real stop of the day was at the National Border Patrol Museum. Surprisingly it is entirely donor based. 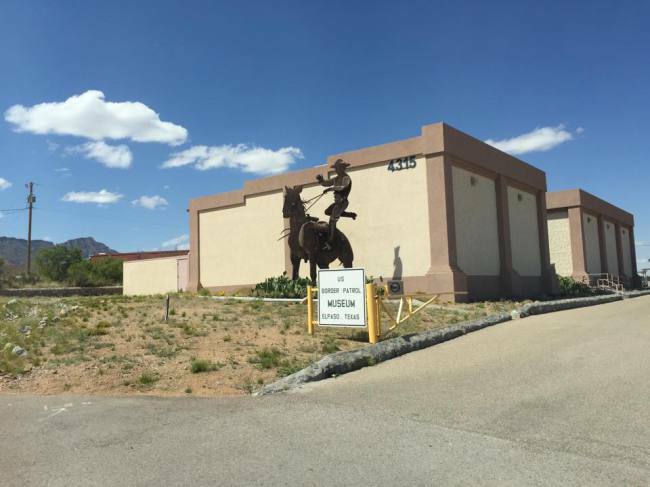 No federal funding is used to support the museum. Inside, the museum is divided into small sections. One area was devoted to Border Patrol vehicles. Another honored those agents that had died. On section explained the history of the Patrol, how it originated and evolved over time. It’s a nice little museum that doesn’t take long to peruse. 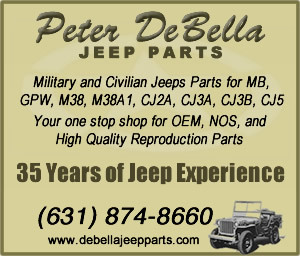 Of course, I was there to see the jeeps. 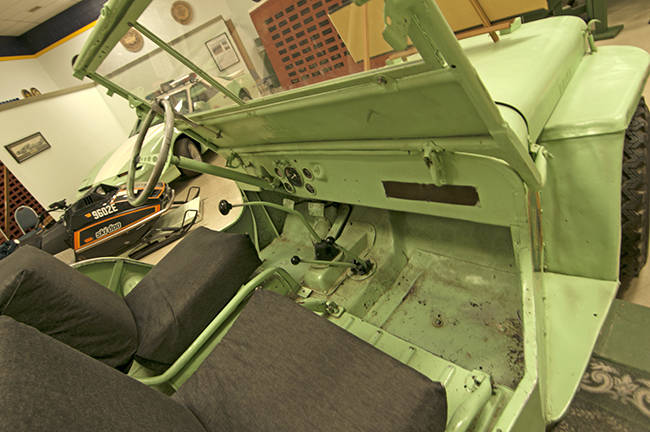 In fact, their 1947 CJ-2A is one of the center-pieces of the vehicle exhibit. 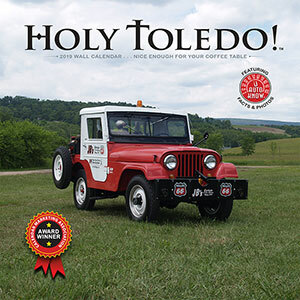 The jeep was assembled by volunteers. The front frame rails have more patches than a leftovers quilt. And, the floors aren’t particularly pretty. But, it’s doing the job! 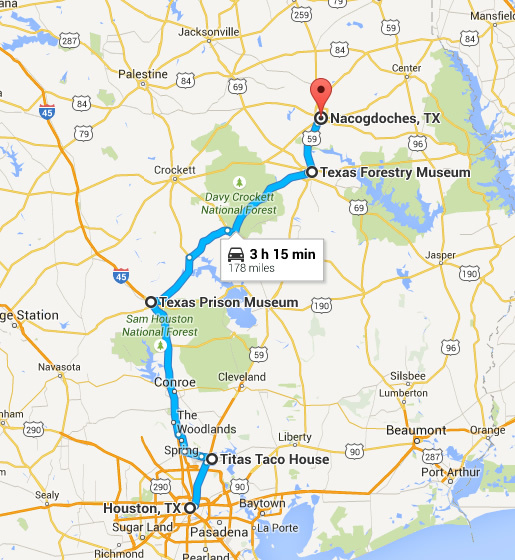 April 24, 2015 • CATEGORIES: Features • TAGS: 2015-Texas-Trip. On Wednesday I had a slight relapse, mostly from lack of sleep. So, Wednesday night I finally got some good sleep (10 hours worth) with the help of Tylenol PM. That’s exactly what I needed. All Thursday I felt like myself. Ann felt good all day too (even got herself a pedicure). Feeling confident, we will hit the road again today (Friday) and we will FINALLY be in Texas by Friday evening! It’s only taken a week and a half to get there. 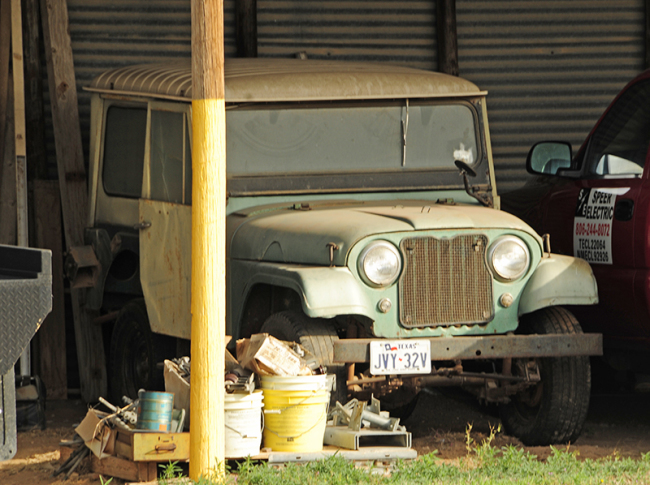 Our first stop in El Paso is to see a museum about some jeeps. And so we bid adeiu to Fred and Cindy, the Stong Hospital and Recovery Compound, and the panoramic backyard view we enjoyed through sickness and in health. Not much happens in their backyard, but it was enough to entertain us for a week whether day or night. April 22, 2015 • CATEGORIES: Features • TAGS: 2015-Texas-Trip. To whom should credit be given for that all-too-accurate phrase, no good deed goes unpunished? One need look no further than our bedroom to comprehend its accuracy. To wit, my wonderful wife who cared for me during my darkest hours with the plague has now succumbed to its wretched claws. Now she suffers the coughs, the chills, and all manner of inhumane indignities brought on by the horrid influenza. Tissues (with aloe) shall become her solace as she extricates the worst of dregs, nasally, from her being. On a sunnier note, as of this evening I have shaken the devil from me. No chills, no fever, no sweating, and no more tissues!! It is no less a miracle than Jesus with Lazarus. I am reborn! 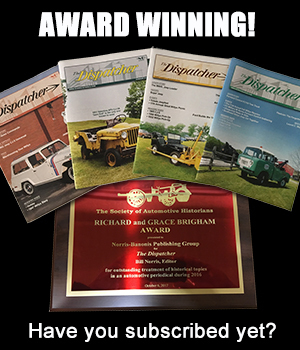 So, yes dear readers, we remain in quarantine for a couple more days. We are now a month behind my initial schedule. Fortunately, schedules matter naught to us! April 21, 2015 • CATEGORIES: Features • TAGS: 2015-Texas-Trip. I felt better today, but still sneezing and coughing quite a bit. However, Ann spent some time wandering around Alamagordo taking photos (good for her!). She even managed to wiggle her way onto private grounds to photograph building used in several meetings (Fred and Cindy tells us that usually NO ONE is allowed to go inside the gates). I hope to publish some of her photos on Wednesday. 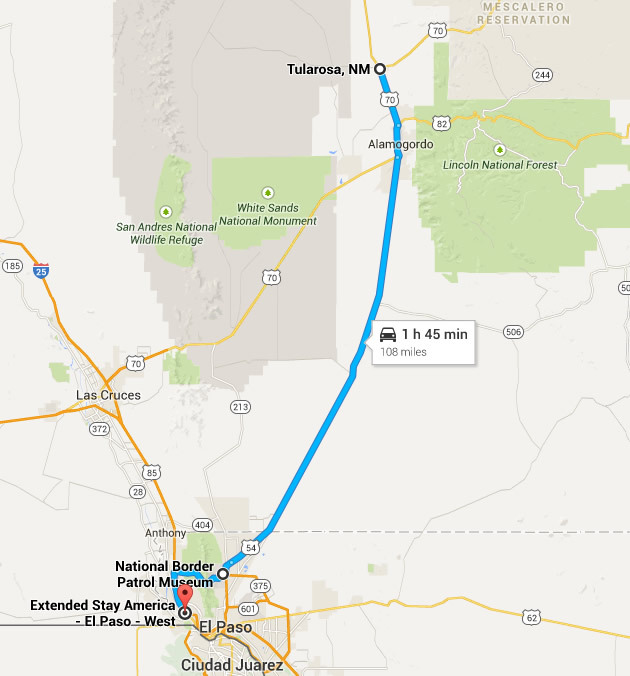 We will most likely leave Tularosa on Wednesday. I got a bit of good news. Ann and I will be the inaugural guests at Red River’s Bed and Breakfast in Fredericksburg, Texas (once the plague leaves me and we can make it there). Tomorrow I will nail down a date with James. 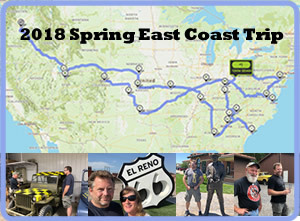 James runs the Red River Jeep Tours in Red River, NM, along with the Uncorked Wine Tour and now a bed and breakfast in Fredericksburg. 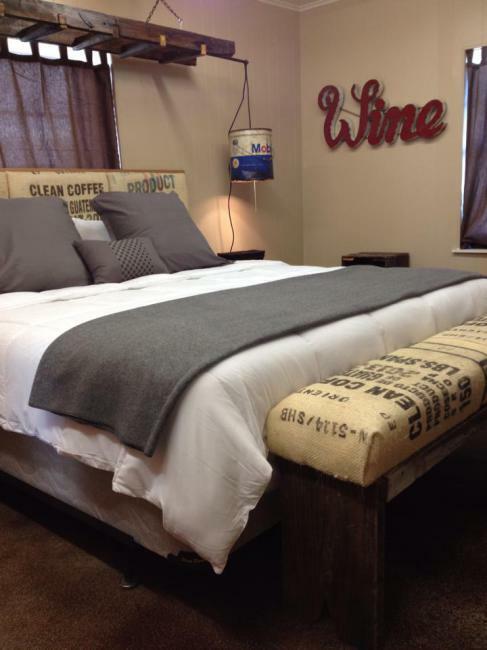 How about those bed lights!